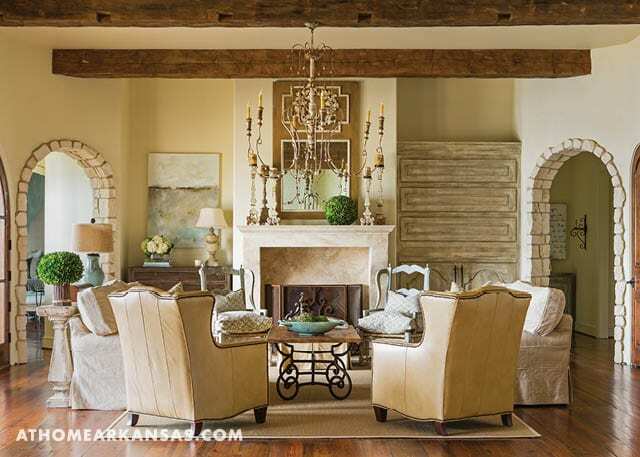 As the saying goes, “the third times a charm.” While the first two homes built by this Little Rock couple were equally desirable and attractive, the third space they completed together—a home on the shores of the Arkansas River—seems to be a true culmination of their passion for the outdoors as well as their desire for a clean and calm interior space. 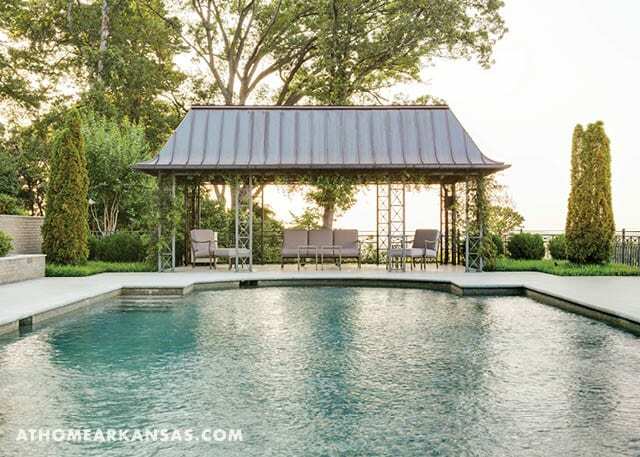 With a bit of foresight and the help of talented Little Rock-based designer Janna Toland they created a space that’s sure to be called home for decades to come. 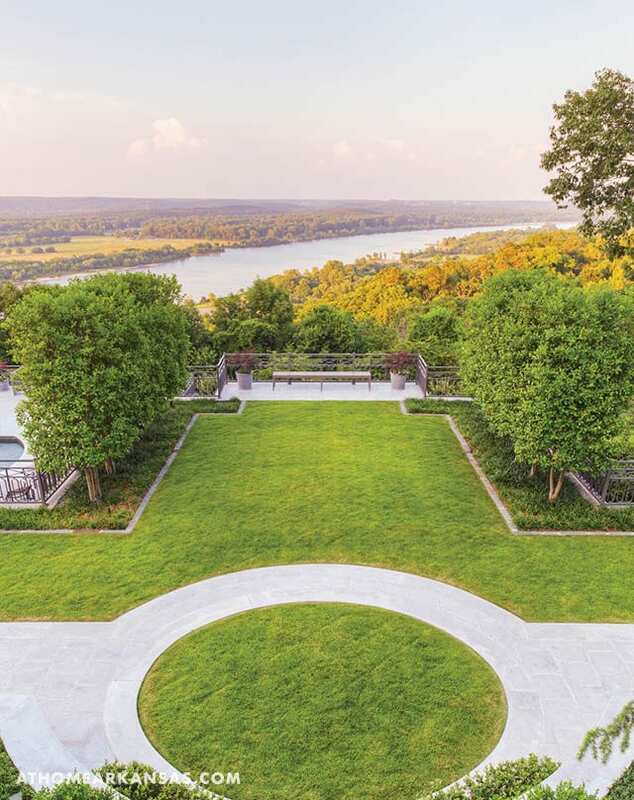 “We had always lived in a neighborhood, and we knew we wanted land,” the homeowner says of the prompt to purchase approximately nine acres on the banks of the Arkansas River in West Little Rock. 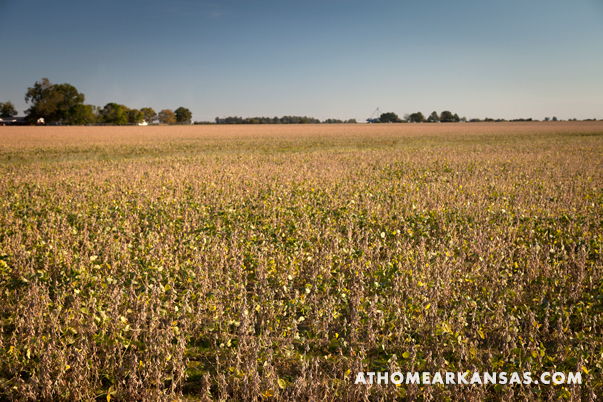 Initially, the land was far from build-ready. 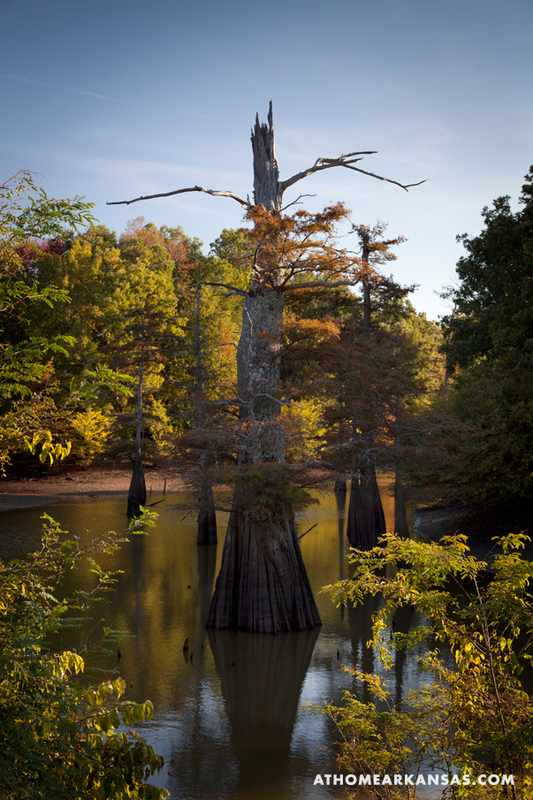 “When we first bought the property, you couldn’t see the river. So we leveled the land and cleared the property and built a sea wall to help with flooding and erosion,” the homeowner says. 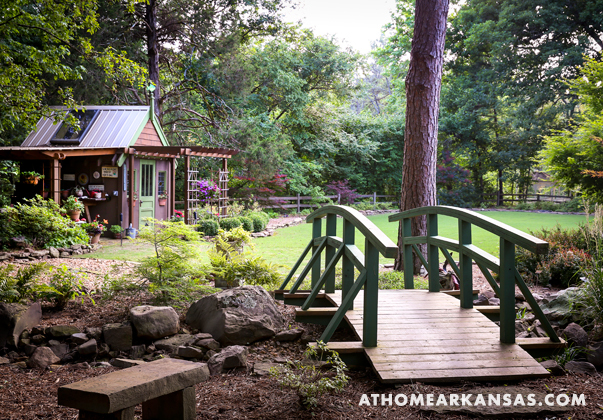 Once the canvas was set, it was time to begin work on the home itself. Because of their past experience, they had some ideas in mind. “We sketched out the plans ourselves. 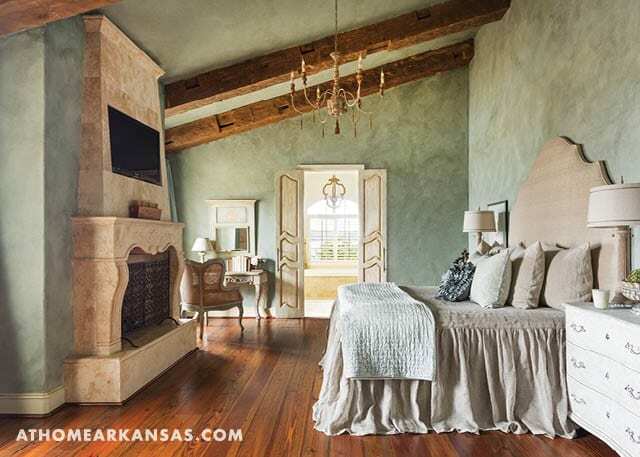 We got pictures from magazines and pieced it together, you know, where we wanted the rooms to go and the size of them,” the homeowner explains. 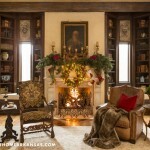 From there, they took the ideas and sketches to Gwen Couch, a relative with experience in drawing and designing homes. “She kind of pieced it together like a puzzle,” the homeowner says. 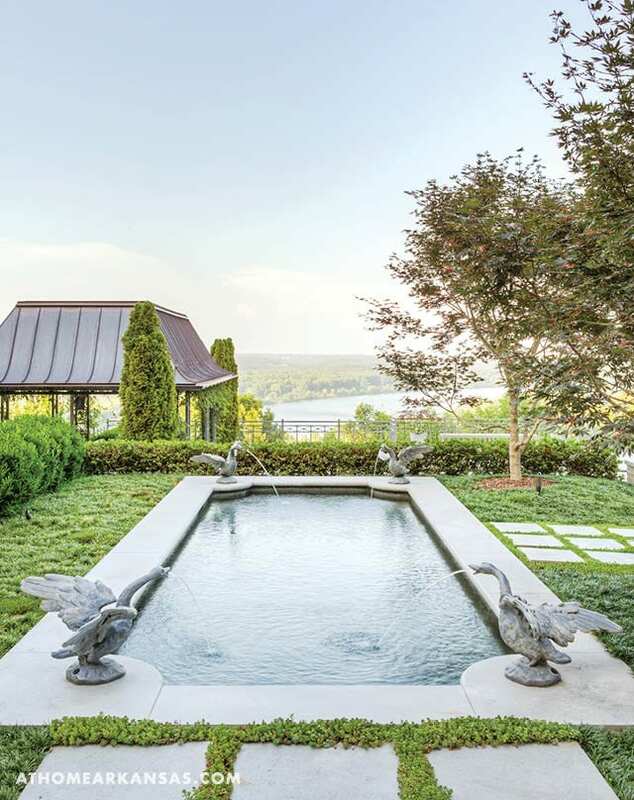 These sketches included a stone façade, open living area with access to a pool and a view of the river, as well as five bedrooms to accommodate their soon-to-be-grown family, which includes two sons in college and one in high school. 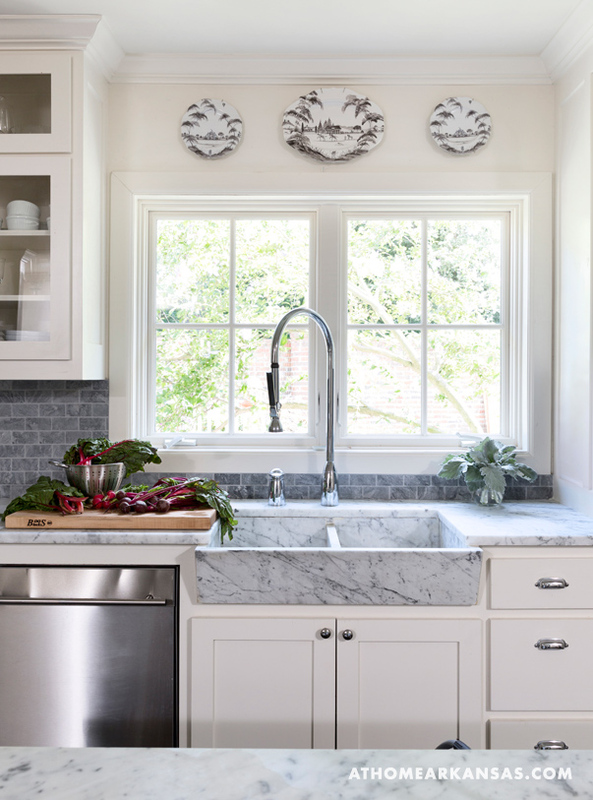 High on the priority list were lots of windows for light and “good living space, so there’s plenty of room for everyone when the boys come home,” the homeowner adds. 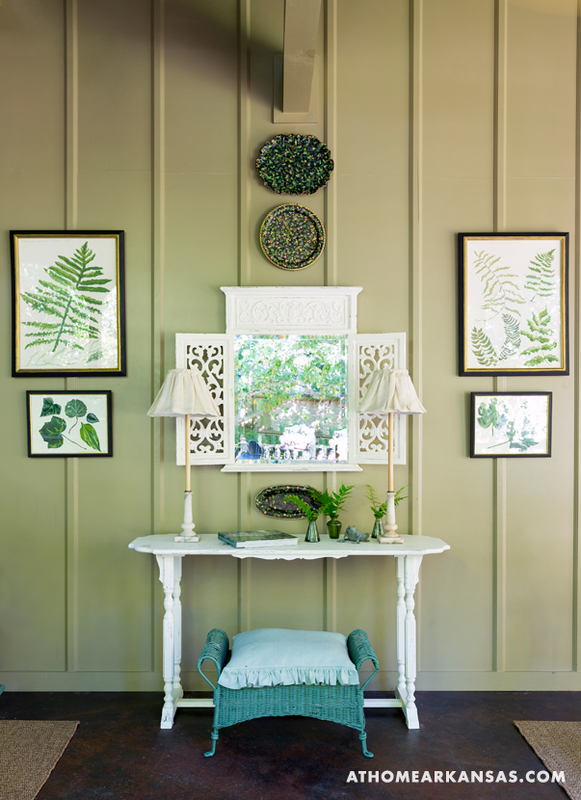 ‘The paint treatments and selected palette throughout the home are perhaps the most prominent display of this style. The entire home is wrapped in light, unimposing hues that are reflective of the nearby river as well as the land. 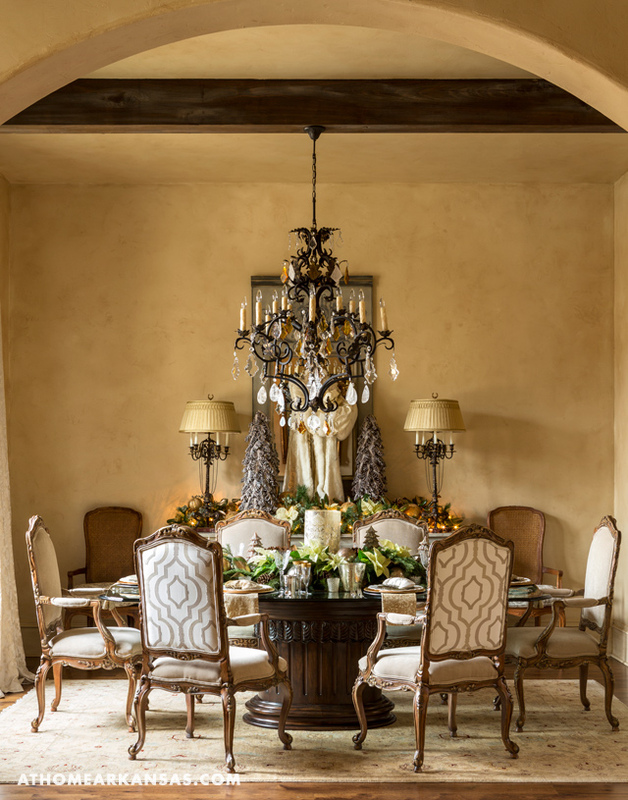 “We used safe neutrals that reflect the outdoors without being overbearing,” Toland says. 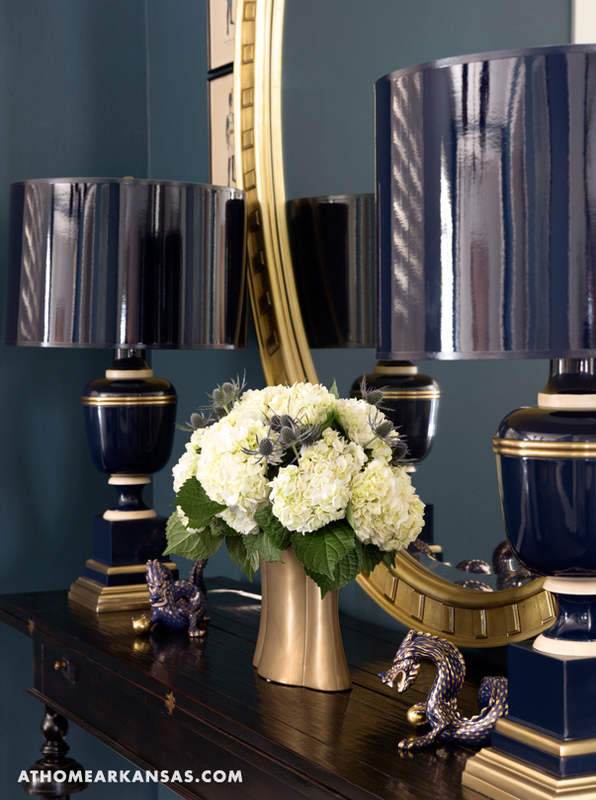 To add interest and boldness to the design, Toland relied on textures and finishes. For example, a custom suede paint treatment on the walls provides depth and detail as well as a fluidity that’s reminiscent of the water. 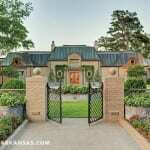 Of course, as the homeowner noted, much of the appeal of the home site was the location. 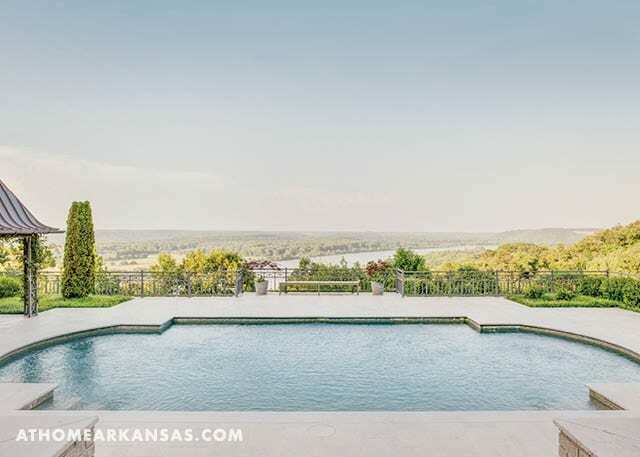 To make the most of the riverfront setting, the home was designed in a U shape that opens up to reveal a view of the pool and outdoor area as well as the Arkansas River. 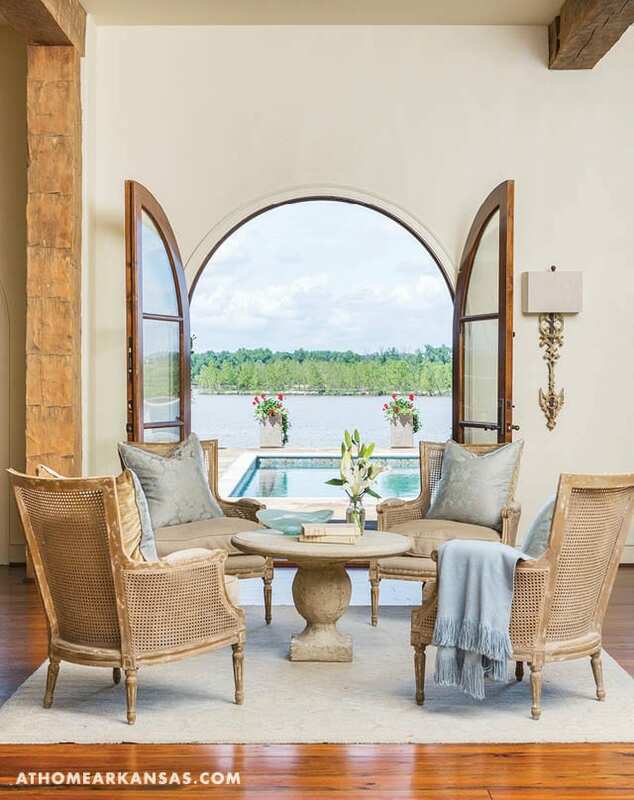 Floor-to-ceiling windows and doors in all of the rooms that face the body of water give an unobstructed view and also allow an abundance of natural light to flow into the interior spaces. 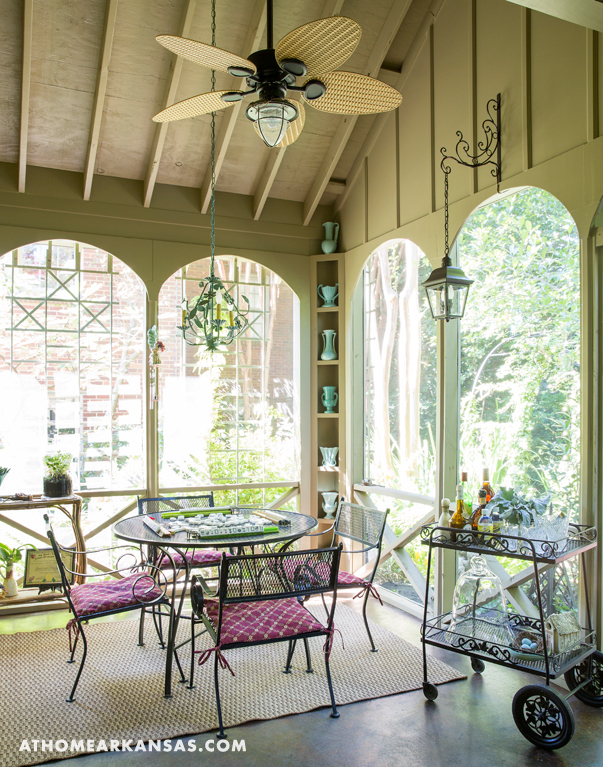 Toland notes that it was a main goal to casually extend the living space outdoors with the same European-influenced style. 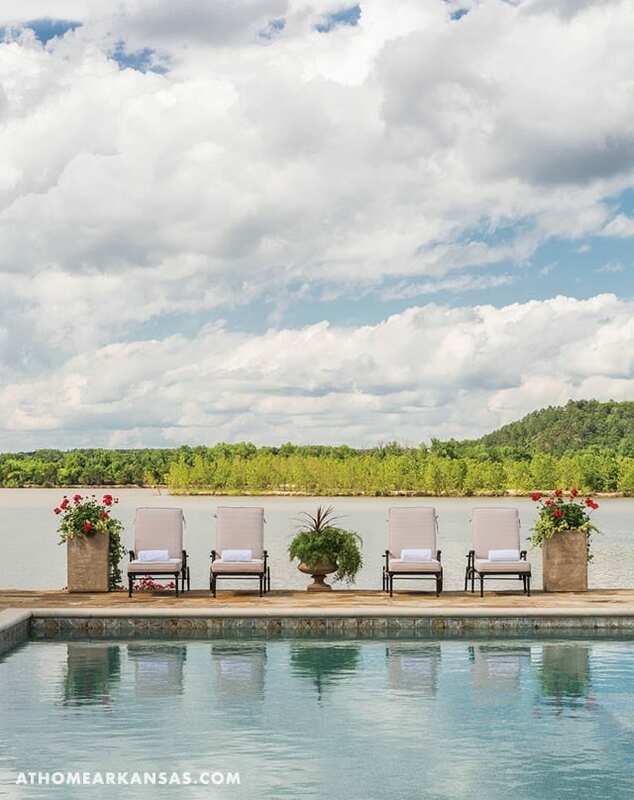 “The emphasis continued with layering the textures of stone, wood, concrete, rattan, and iron and then using soft linens to accent the gorgeous outdoor backdrop and water. 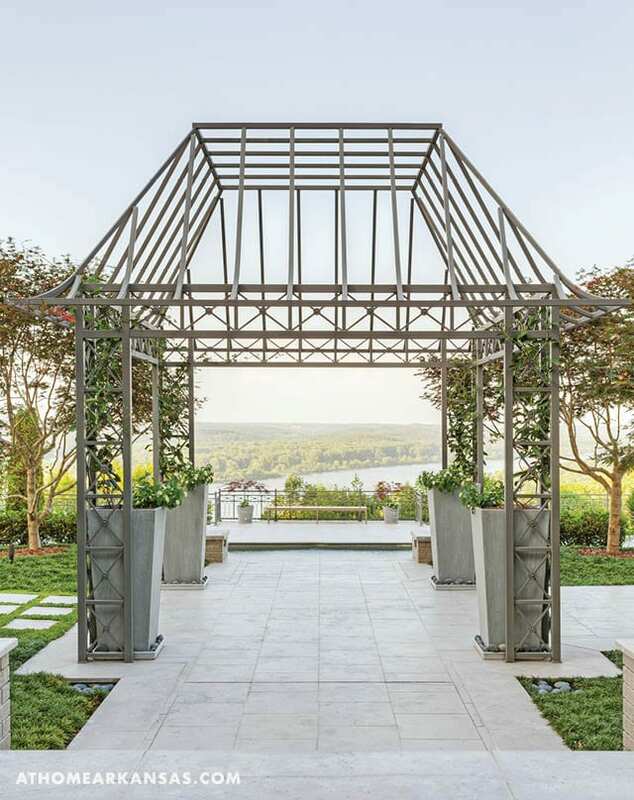 We did not want to create too much overdone color and pattern that would take your focus off the water or the picturesque landscape backdrop that seasonally provides its own texture and design,” Toland says. 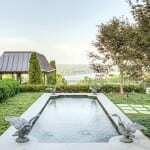 As for how the family enjoys the outdoor space, the homeowner says, “we love the view because you see the island and Maumelle, and we have a boat dock where the boys have a fishing boat. 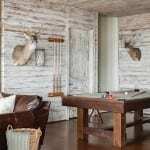 My boys and husband are big hunters and fishers, so they love living here for that aspect.” This coupled with the interior’s welcoming design make the couple’s third newly built home one that would be hard to top. 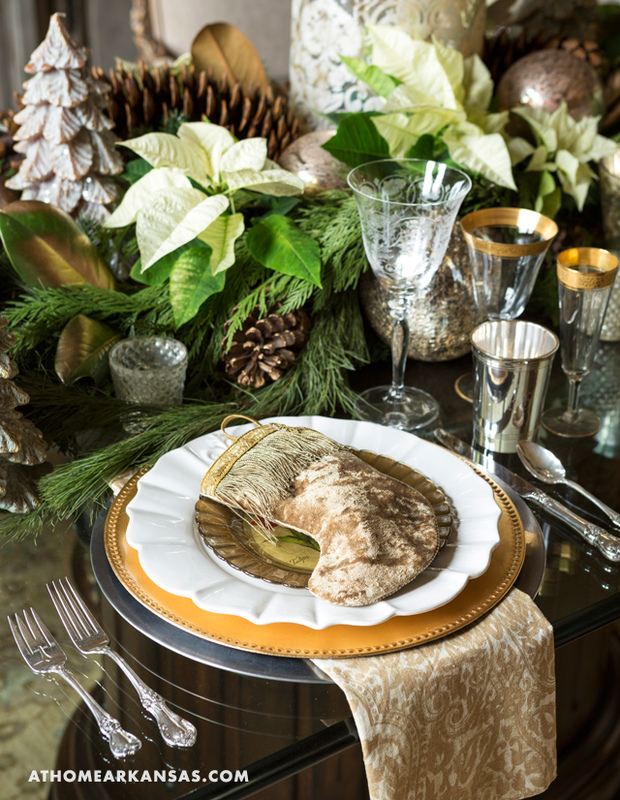 Because the holidays are a time for gathering and celebration, Thompson notes, seasonal décor choices are also about hospitality and how you plan to use your home to entertain. 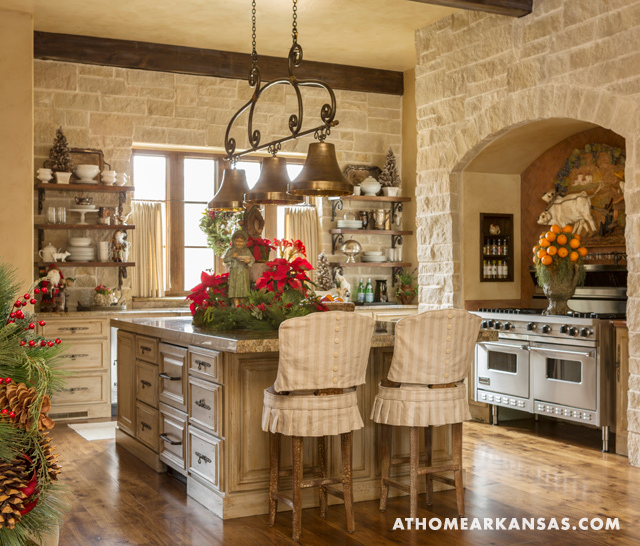 “When you’ve worked hard to make your house feel special, you want to share it with loved ones,” she says. 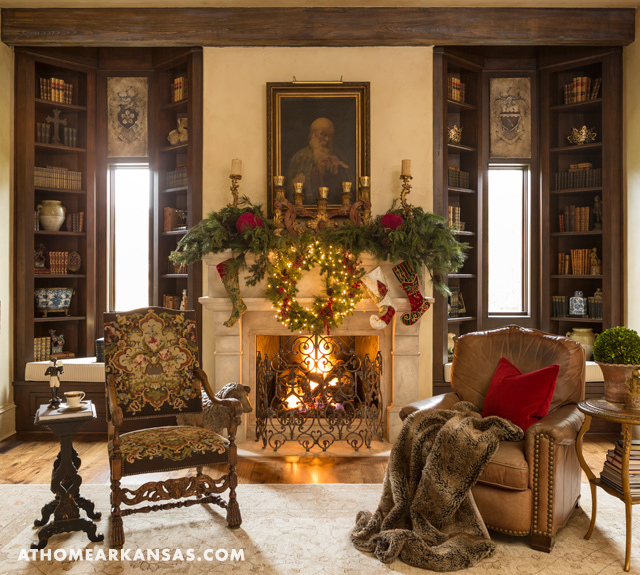 Because the hosting schedule is likely to include gatherings of various sizes, Thompson keeps her decorations adaptable, especially in her dining room. 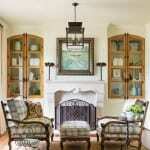 “I start with the sideboard, and then repeat the same elements on the dining room table. 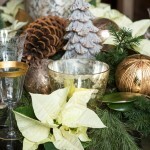 I keep the table decorations low and simple for dinner parties, and then I add fullness and height for large gatherings, where food will be served buffet-style. 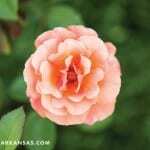 It has to be easy to transition, to go back and forth without starting all over,” she explains. 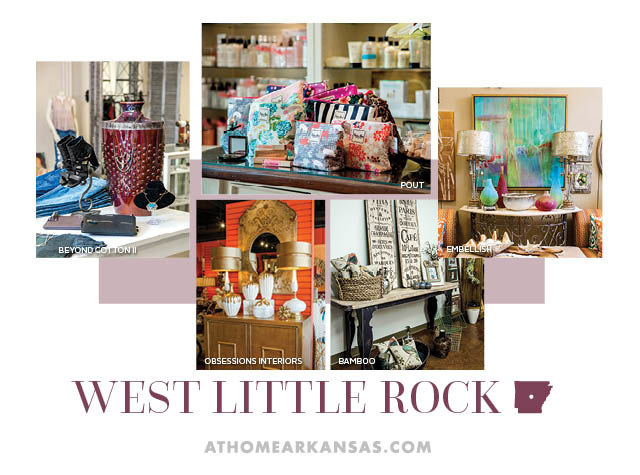 Home to a variety of restaurants, boutiques, and home décor retailers, West Little Rock is a hub for shopping—whatever your need may be. 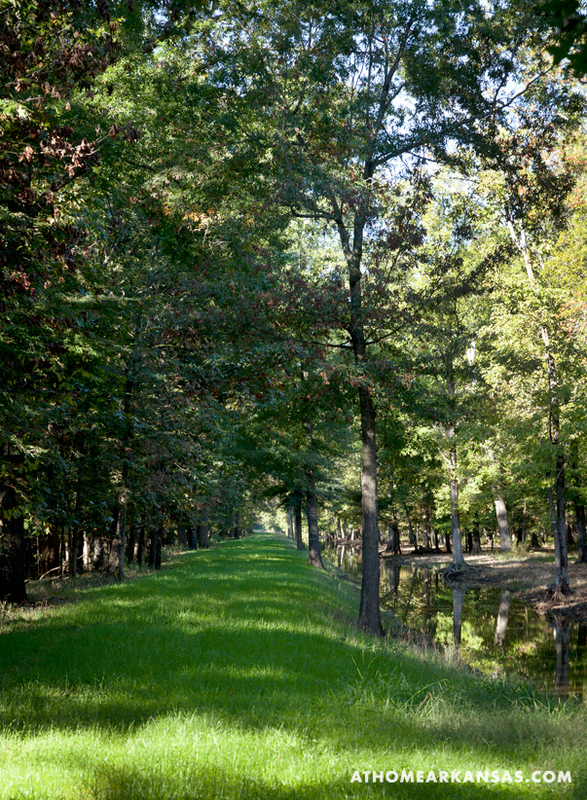 Read on for a few of our favorite destinations. Start your day at Pleasant Ridge Town Center, located on Cantrell Road. For the latest in women’s fashion and accessories, check out Beyond Cotton II (501-221-1539). Give your wardrobe a refresh for fall with new denim styles, booties, and accessories—including jewelry and handbags. Among their most recent additions is the Adina Reyter jewelry line, which is a celebrity favorite thanks to its contemporary-meets-classic style that is perfect for everyday wear. Stop in to let the friendly, trendsetting staff help with your wardrobe needs. For all of your skincare and cosmetic needs, step just next door—or through the shared interior doorway—to Pout (501-224-8222, poutoflr.com). In addition to the shop’s first-class selection of makeup (including their new Chantecaille line), skincare products, cosmetic bags, gift items, and more, they also have an in-house aesthetician. Make your appointment for a facial, peel, waxing, or airbrush tan session—all done onsite in the convenient and welcoming location. What’s more, they also offer makeup application for weddings, proms, and special events. Pout is truly a neighborhood gem for women of all ages and skin types who want to look and feel their best. 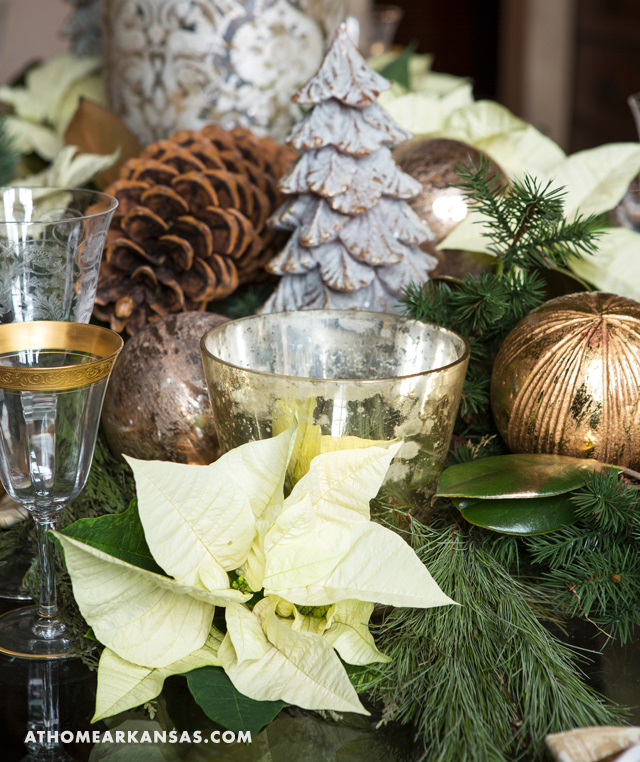 From there, head just across the parking lot to another of the center’s fabulous stops, Embellish (501-223-6965), where you’ll find a huge selection of furnishings, art, and accessories—perfect for your own home or to give as a gift. Whether it’s a large piece of art, an upholstered chair, a colorful rug, or just a few decorative items to give your space personality, Embellish is a must-visit shop for what you seek, with a range of styles and price points. 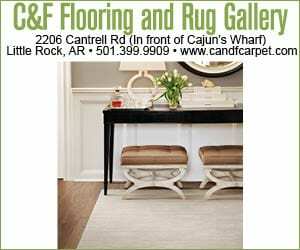 Continue down Cantrell Road to Obsessions Interiors (501-868-9333). 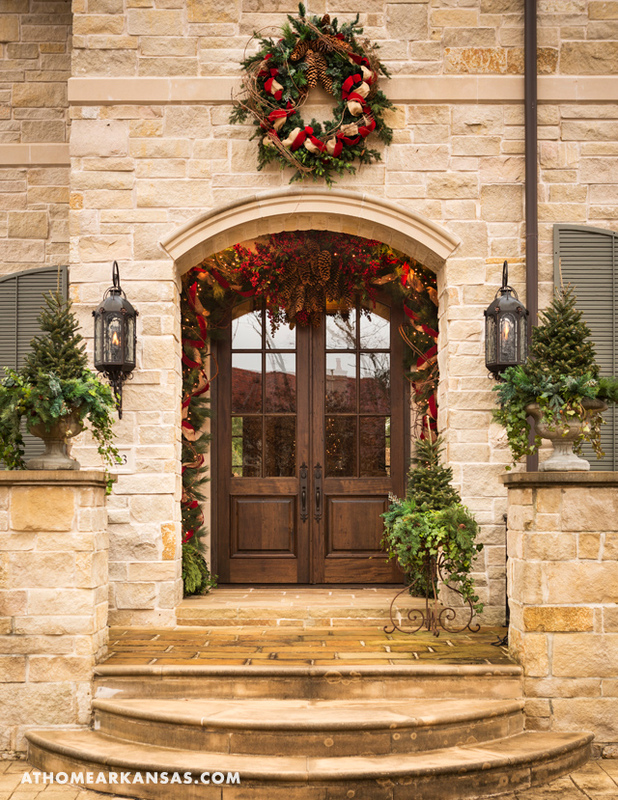 As a premier store for home décor and furnishings, Obsessions can help you outfit your home with everything you need—whether your style is timeless or trendy. 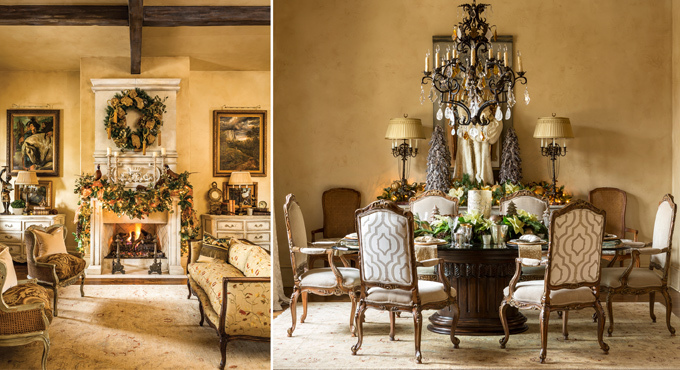 The 6,300-square-foot showroom features lamps, original art, accessories, side tables, chairs, sofas, and more. Their in-house designers can work with you to create a fully furnished dream design or to help you find a few new pieces to update your look. Follow them on Facebook for their latest arrivals. 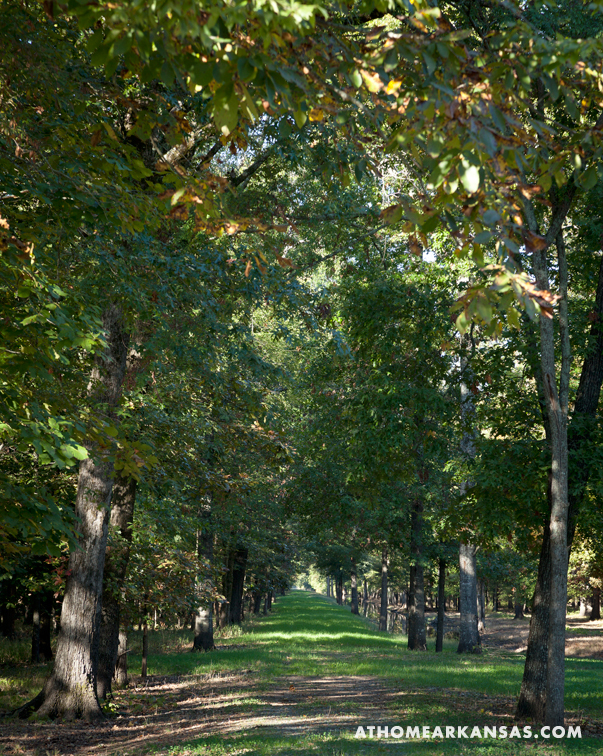 Next, head over to Rodney Parham Road to Bamboo (501-228-0063, icmbamboo.com). As a part of Independent Case Management (ICM), which is a non-profit that provides support for individuals with developmental disabilities, Bamboo serves a need in the community and provides stylish home wares and gift items. Visit them and you may find an ICM client staffing the store as a part of a paid internship program that helps develop job skills and training. 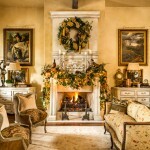 Be sure to check out their seasonal arrivals for fall, including frames, throw pillows, and wall hangings. The store is open Tuesday – Saturday, 12 – 6 p.m.
Last but certainly not least, Reinvented Vintage (501-350-4769, reinvented-vintage.com) is a true treasure and a destination not to be missed. 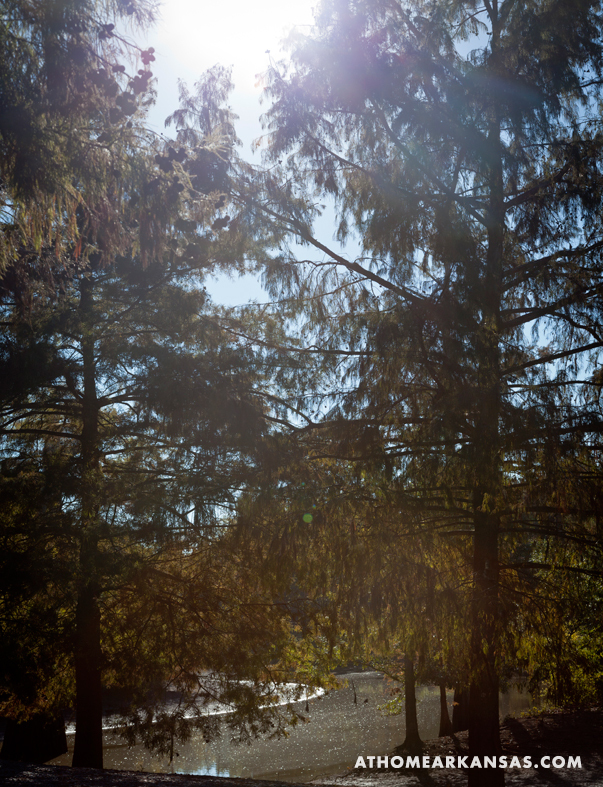 Visit them in the Breckenridge Village Shopping Center to see their new arrivals, including tees from Charlie Southern and cozy, rewashed flannel shirts for fall. 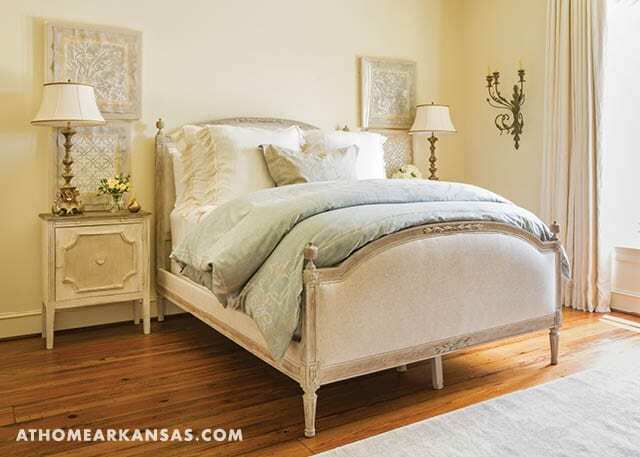 Known for their amazing selection of painted furniture pieces—as well as all the paint supplies for your own milk- or chalk-paint DIY project—Reinvented Vintage also has a great new selection of rugs, throws, pillows, and original artwork. Check out their hands-on paint classes, offered twice per month. 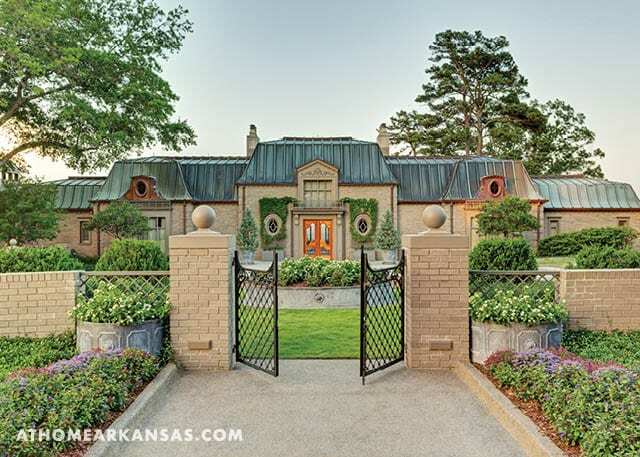 If you live in the West Little Rock area or are planning to move there, you’ll need a solid list of resources to keep your home running at its peak and looking its best. 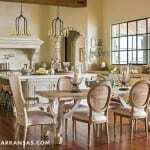 We suggest starting with a consultation with designer Shayla Copas of Shayla Copas Interiors (501-258-7396, shaylacopas.com), who can help you make your house a home. 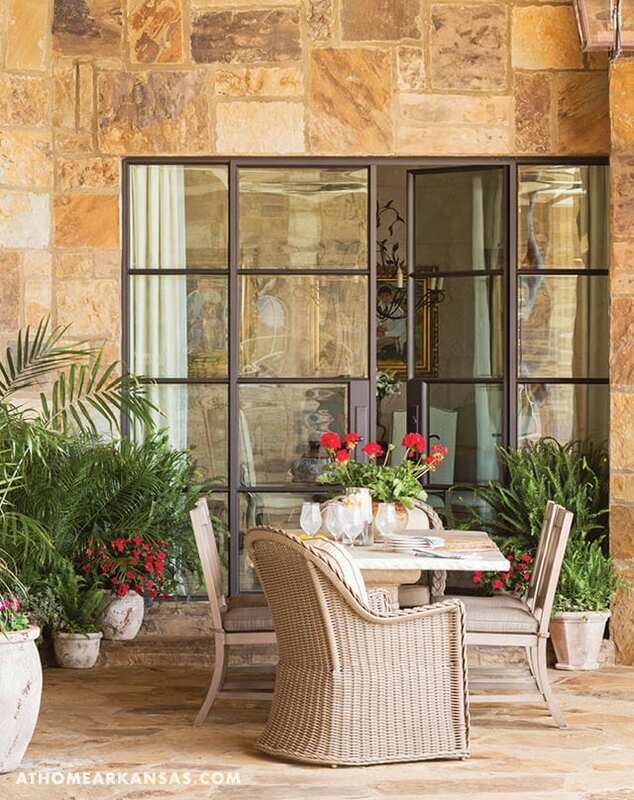 Whether you are starting from scratch with a new build or you need help with personalization, Copas has the experience and style to set your home apart with timeless, eye-catching design elements. 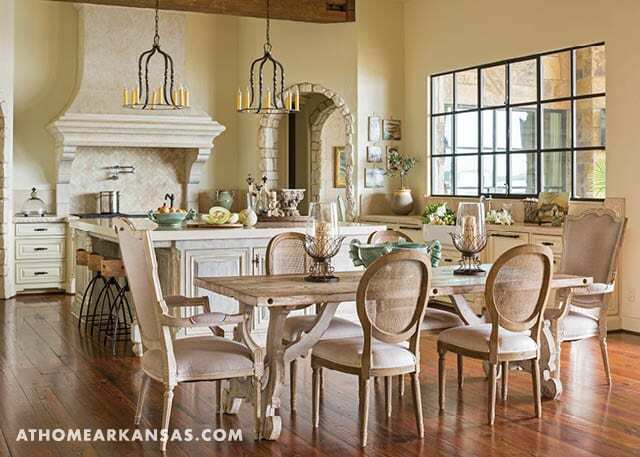 If you’re looking for a local showroom that also offers interior design consultations, visit Phoenix Interiors (501-225-0400) where the talented staff can assist you with everything from space planning and furniture placement to selecting a wall color or looking over blueprints to help make design suggestions for a fully functional and beautiful home. 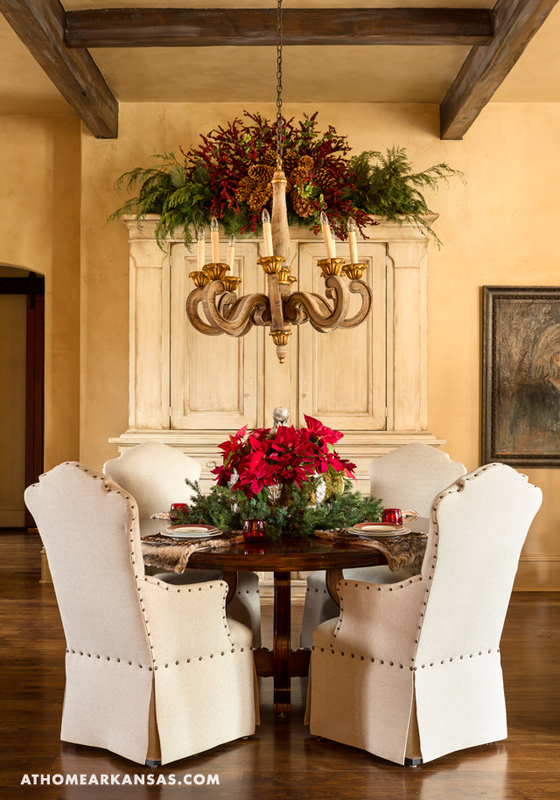 The recently expanded showroom—located just off Chenal Parkway—features 9,000 square feet of gorgeous pieces from lines such as Century, CR Laine, Sherrill Furniture, and other American-made upholstery companies—all ready to go home with you after purchase. 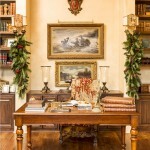 In addition, you’ll find a well-stocked selection of accessories, art, glassware, pillows, candles, jewelry, and gift items. 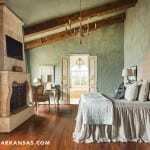 From there head down Cantrell Road / Highway 10 to the newly opened Kaufman by Design West (501-673-3995, kaufmanbydesign.com). 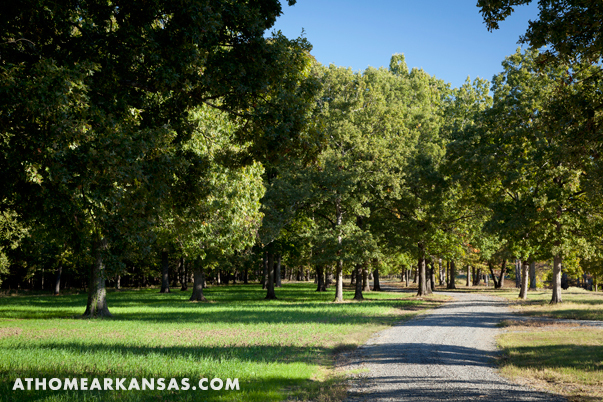 The recently built shopping center is an extension of one of Arkansas’s most-trusted names in the building industry, Kaufman Lumber. This location was created with a focus on all the design elements you need for your home, from flooring and lighting to home décor. 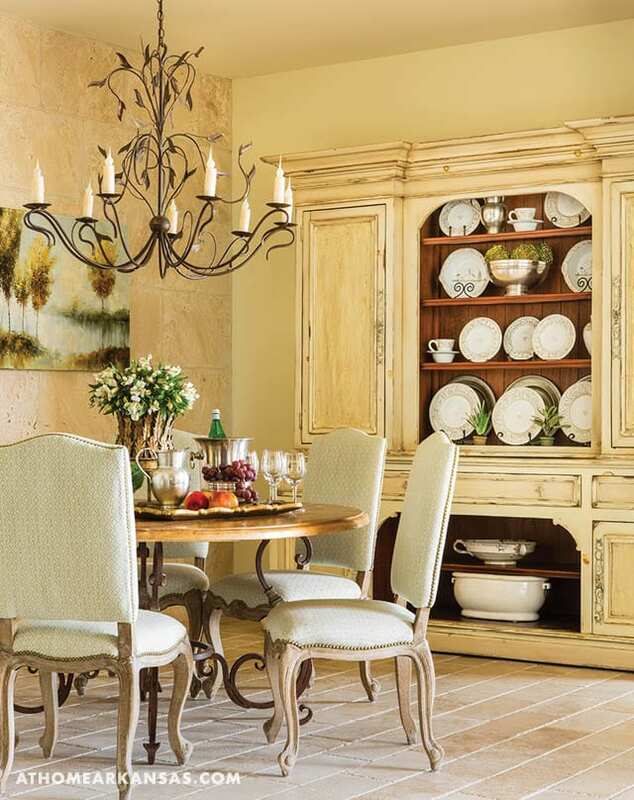 Visit the store’s spacious showroom to see all of the furniture, fixtures, and fantastic finds. 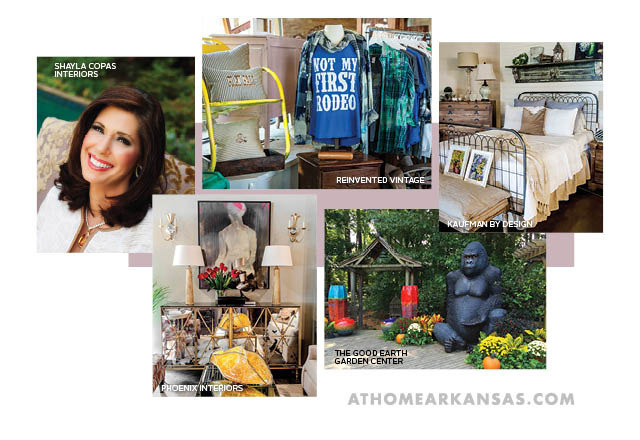 For more information on their opening and offerings, see the feature in this issue’s “Latest” section. 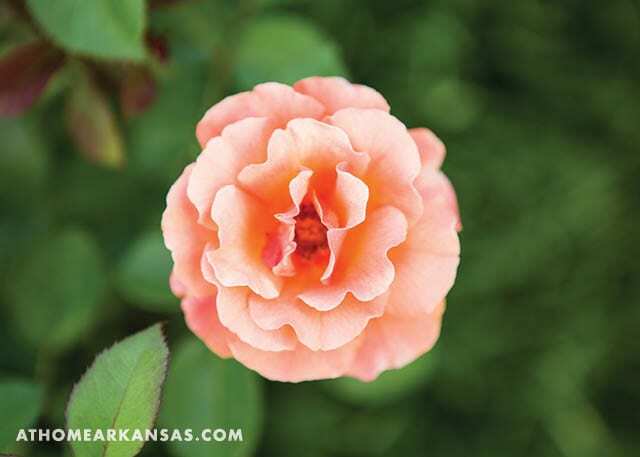 Continue west on Highway 10, and you’ll find The Good Earth Garden Center (501-868-4666, thegoodearthgarden.com)—the perfect stop for all of your landscaping, nursery, and outdoor needs. 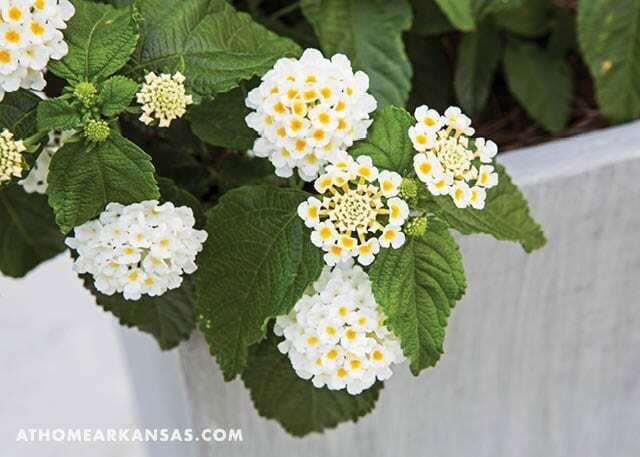 For more than 40 years, the garden center has been a go-to source for Arkansans looking to enhance their home’s curb appeal, spruce up their backyard, or just grow a few favorite plants. 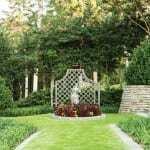 They offer everything from bulbs to vegetables and pottery to fountains. 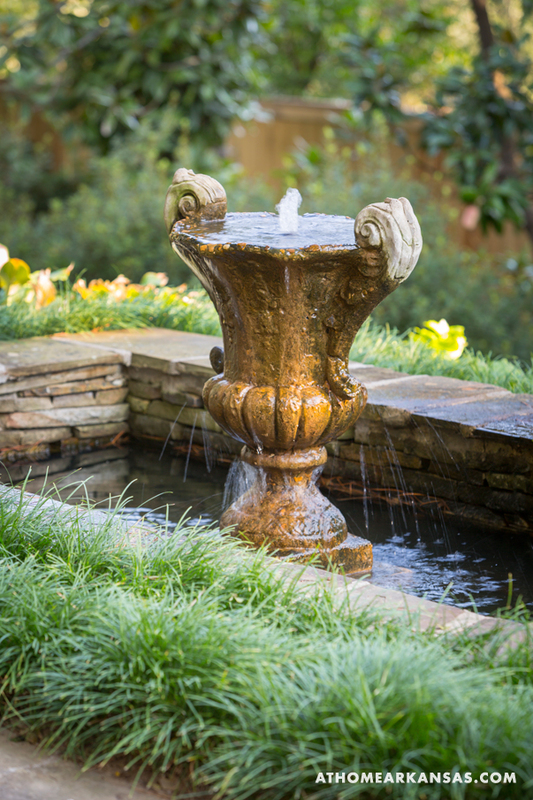 In addition, you can also call on them for landscape design and installation services, Mosquito X misting services, lawn maintenance, and irrigation services. 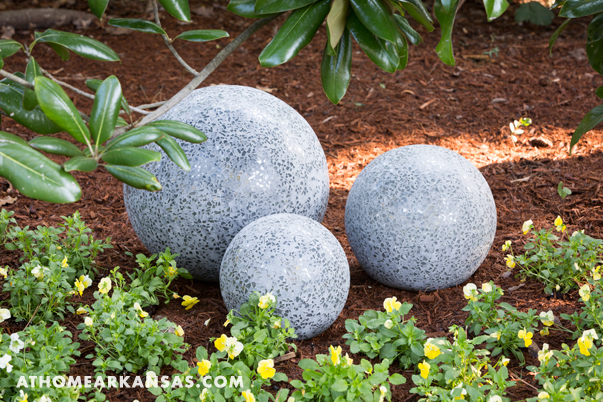 Visit them to see why they were named as one of the 13 Great Garden Centers to Visit by HGTV Gardens. 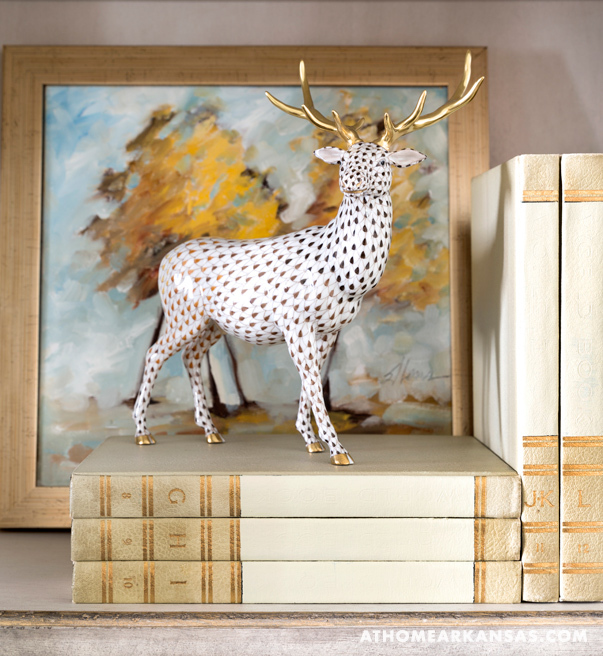 To continue your hunt for great home finds, head to Rodney Parham Road for a number of stops, including Fabrics, Etc. (501-224-6040). Located in the Market Place Shopping Center, the shop offers a great selection of in-store bolt fabrics that can be cut to your desired quantity and taken home that day. 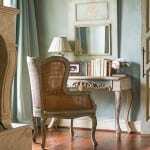 If you have a certain swatch or look in mind, search their large inventory of special-order textiles to find the custom fabrics to complete your space. 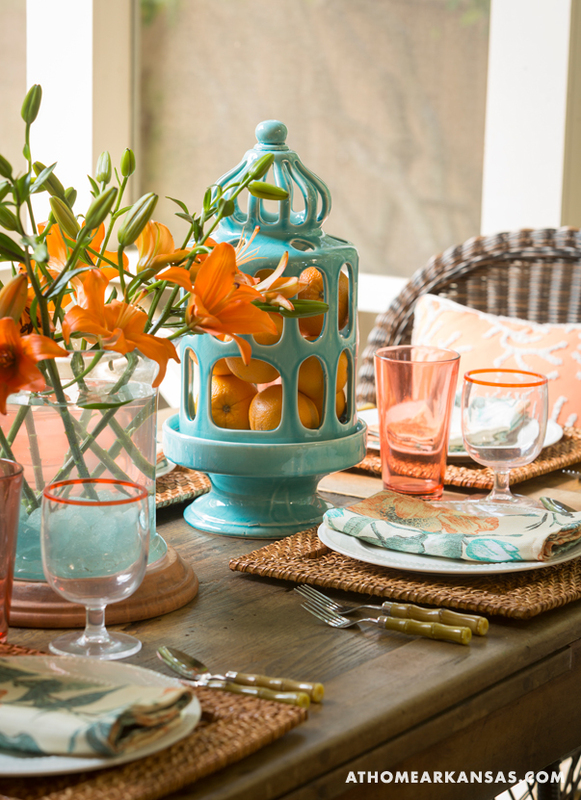 They carry both indoor and outdoor textiles in a range of hues and textures. Fabrics, Etc. 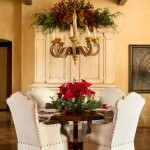 also offers monogramming, custom upholstery, headboards, draperies, bedding, and more. 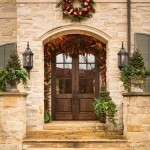 In addition, you’ll find drapery hardware, blinds, and shutters. They also make house calls to offer design help. 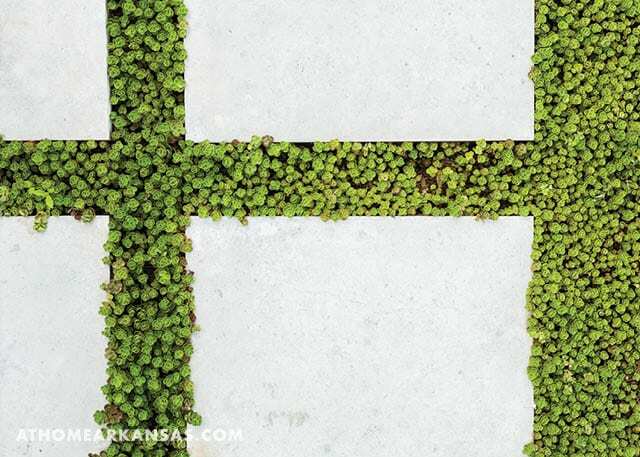 Just across Rodney Parham Road in Pleasant Valley Plaza, you’ll find one of Arkansas’s best sources for outdoor furnishings, Ken Rash’s of Arkansas (501-663-1818, kenrashsoutdoorfurniture.com). 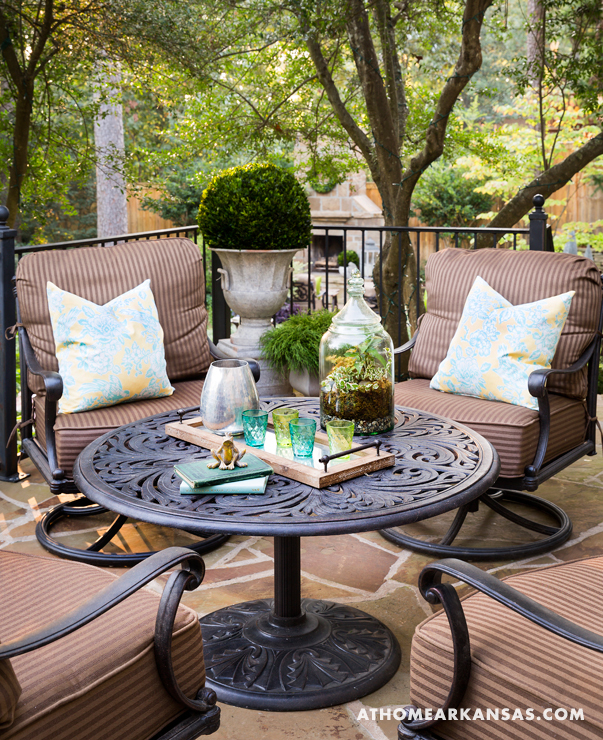 The spacious showroom is filled with outdoor furniture lines such as O.W. Lee, Brown Jordan, Kingsley-Bate, and Lloyd Flanders (see the “Contempo” collection featured in the image above). They also offer a huge selection of grills (including the Big Green Egg) and gas logs. 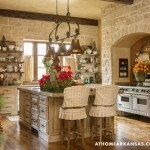 For the interior of your home, don’t miss their large assortment of indoor barstools. Let the friendly staff help you outfit your space. Continuing down Rodney Parham Road to the intersection at Markham, you’ll find a fabulous resource for all your lighting needs. 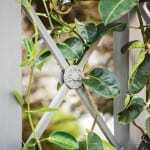 Light Innovations (501-223-9026, light-innovations.com) offers lamps, wall and ceiling fixtures, light controls, LED fixtures, exterior and landscape lighting, and more. 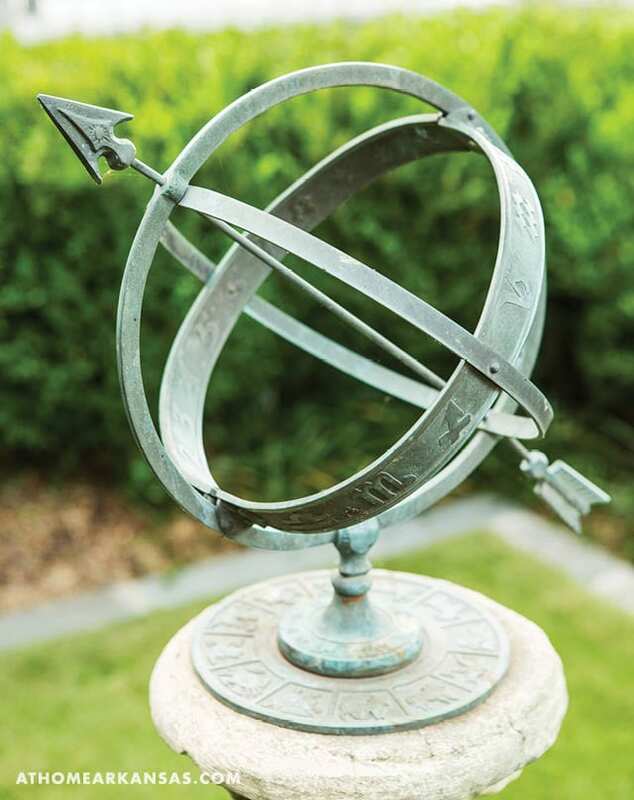 Not only is their showroom stocked with numerous options, they also have special-order catalogs to help you find just the right piece for your home. 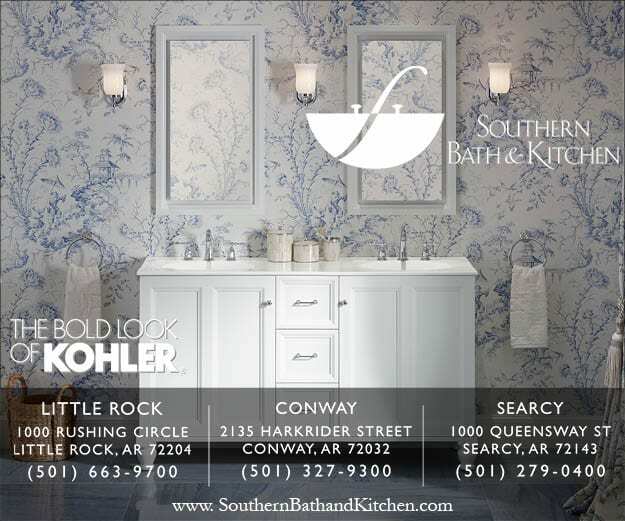 Conveniently located in the same space as Light Innovations, you’ll find PC Hardware (501-224-1724, pchdwe.com). 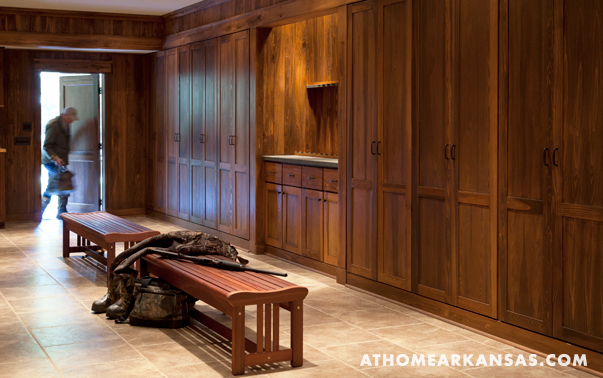 Stocked with much more than just cabinetry and door hardware, the retailer is a must-visit source for anyone who is building or remodeling. 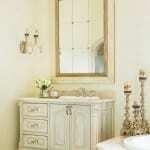 You’ll find faucets, sinks, tubs, fire pit and fireplace materials and accessories, and more. 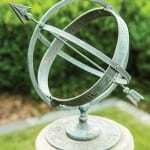 Their knowledgeable staff can assist you with your upcoming project—no matter the size or style. 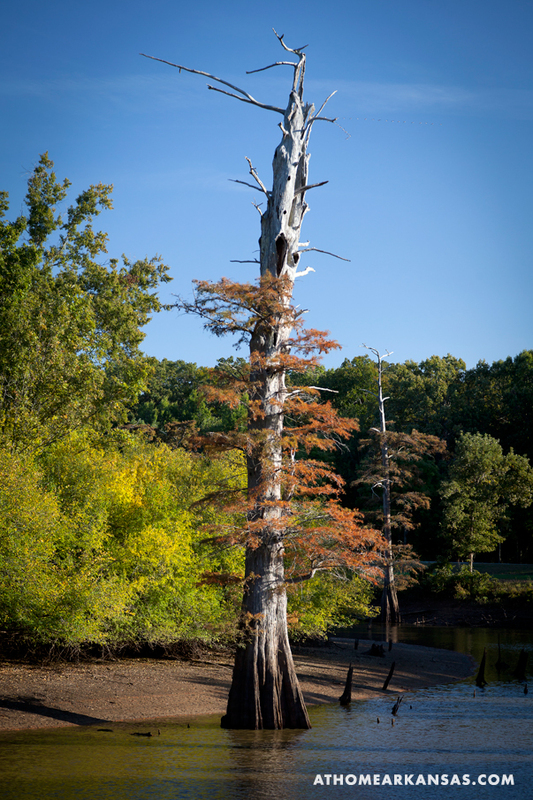 Finally, when you are ready to kick back and relax, the Little Rock Convention and Visitors Bureau (501-376-4781, littlerock.com) has a few ideas in mind for September fun, including the kick-off of the city’s cultural institutions’ new fall season. Take a trip to the theatre by attending Shakespeare’s “Macbeth” at The Rep, which runs September 11–27, or “Puss in Boots” at the Arkansas Children’s Theatre September 18–October 4. 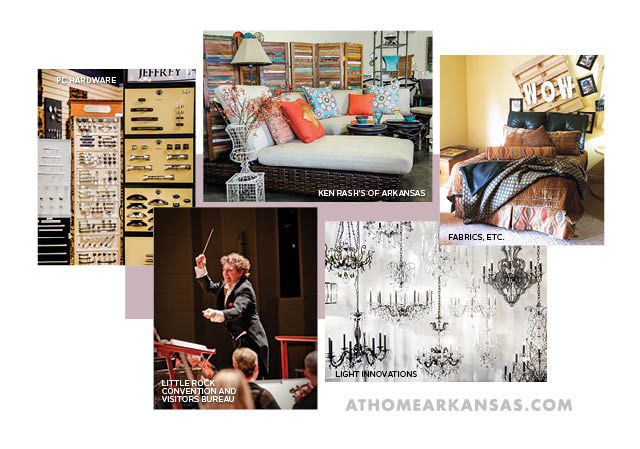 Indulge in a few hours with the Arkansas Symphony Orchestra at the “Grieg’s Piano Concerto,” on September 26 and 27, or get a taste of a variety of arts at the ACANSA Arts Festival to be held September 16–20 in Central Arkansas. 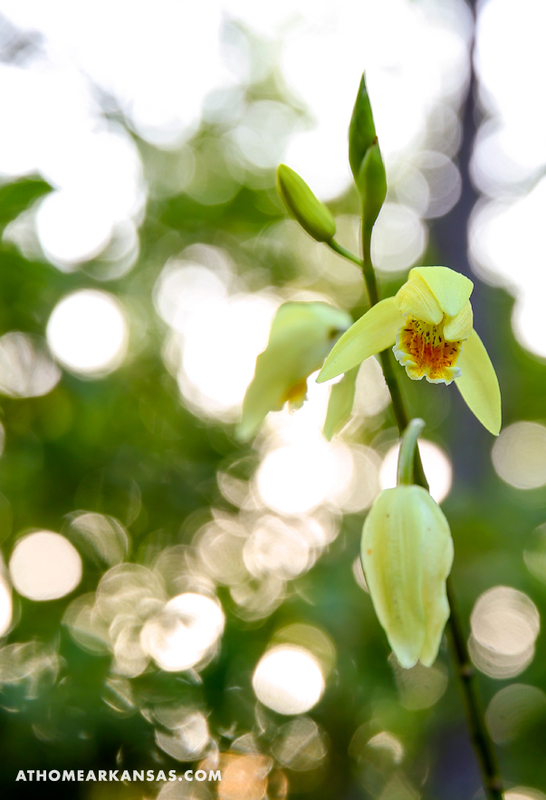 “I’ve never met a flower I didn’t like,” Robin Parker says. 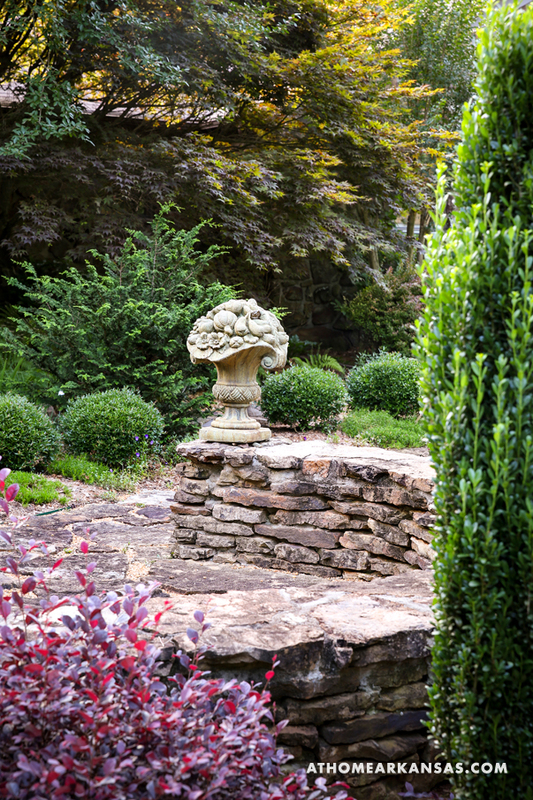 Overflowing with texture and variety, as well as a multitude of vantage points to enjoy the beauty, the garden of the Little Rock home she shares with her husband, Bert, is a true testament to Robin’s word. 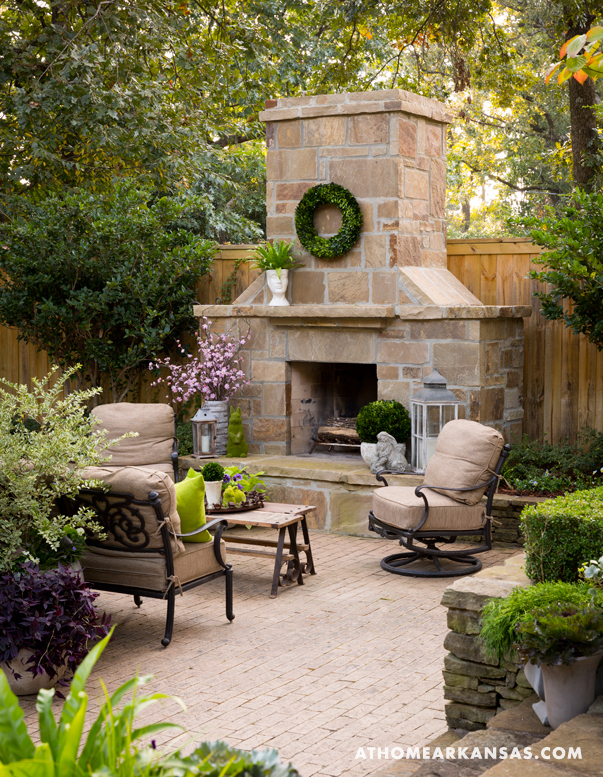 Since moving into their home in 1999, Robin—who is an avid gardener—has made continuous updates to make the outdoor area a place the family can enjoy almost year-round. 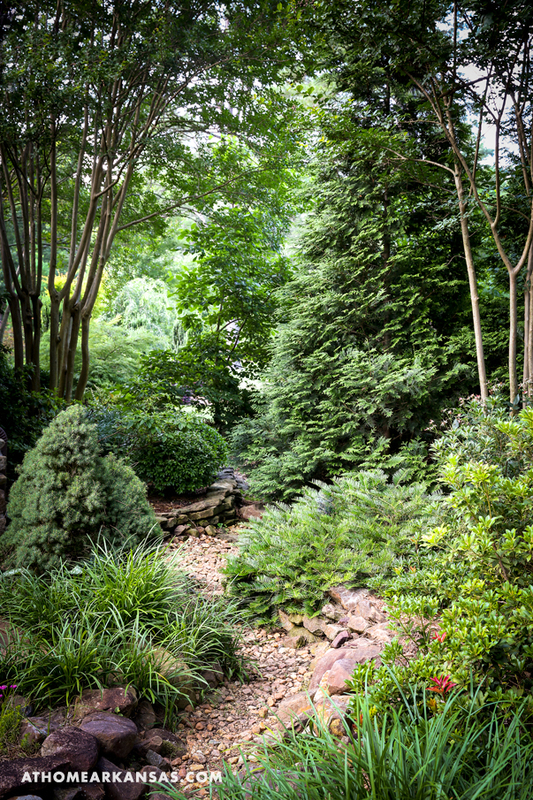 Employing the expertise of The Good Earth Garden Center, where the Parkers’ son Jordan works as a landscape architect, they have created a space that brings enjoyment and beauty at every turn. 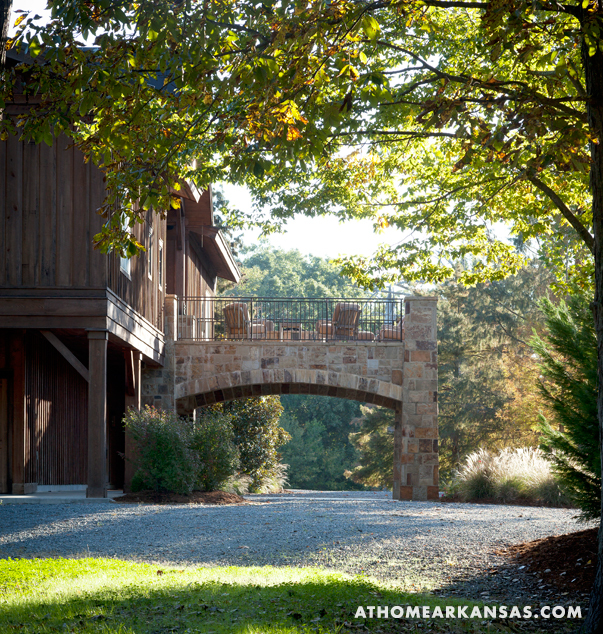 Using natural stone quarried in Clinton, Arkansas, the two envisioned a freestanding fireplace design that has become a frequent gathering space for the family. 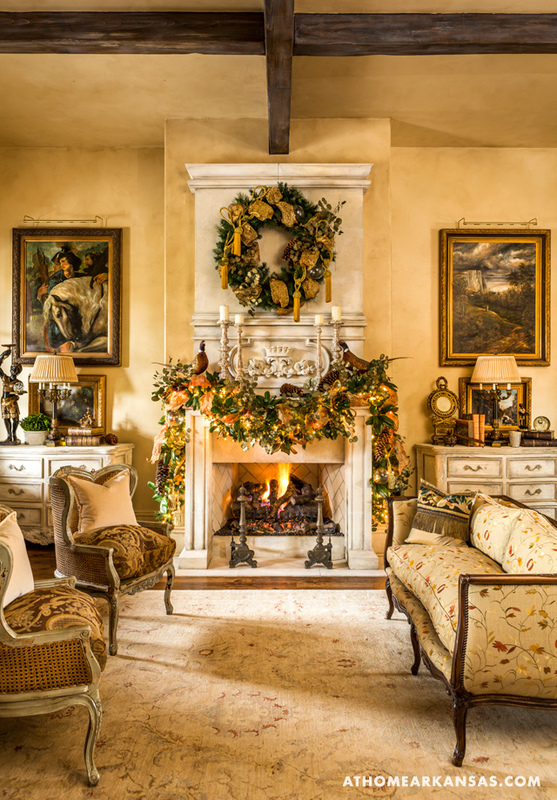 “Since we put the fireplace in, we can use the garden almost year-round,” says Robin, who adds that she often places candles or floral designs inside the fireplace’s inner hearth or firebox when it’s not housing a roaring fire in the cooler months. 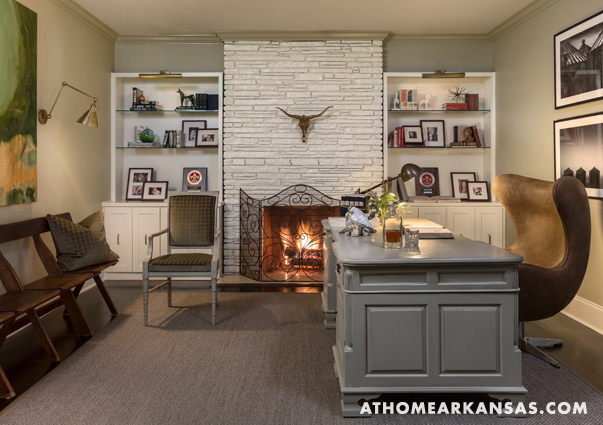 In place of a traditional mantel, Jordan “beefed up” the sides of the fireplace, giving space for container gardens, lanterns, and other accessories. 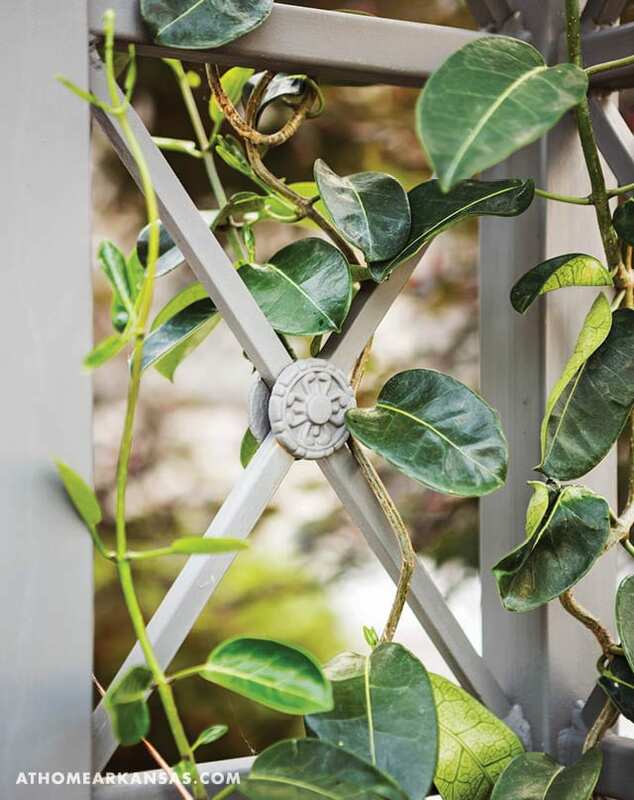 As with any outdoor space, it’s the flora that brings it to life. 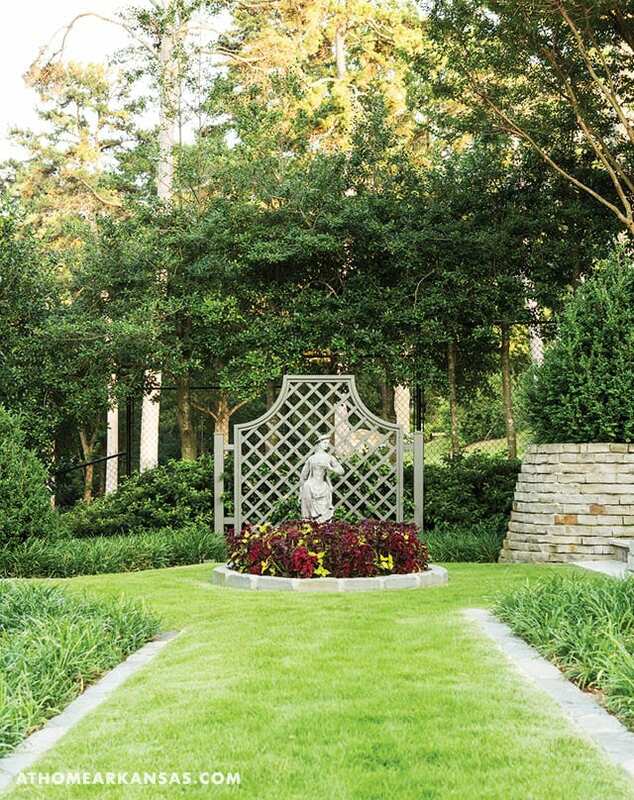 Borders composed of boxwoods and mondo grass along with an expanse of evergreen trees, including ligustrum, planted on either side of the fireplace, keep the entire garden looking beautiful and fresh throughout the year. 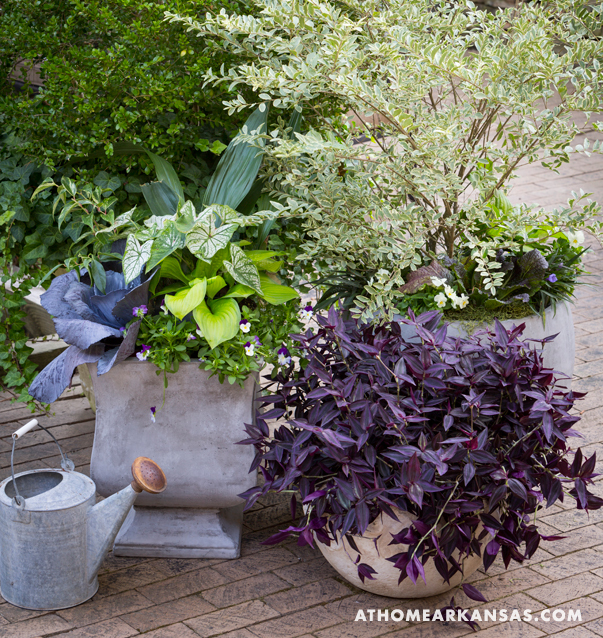 Huge planters are also filled with boxwoods. 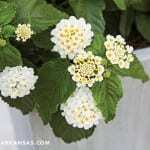 “If shrubs are well watered, they can thrive in planters. 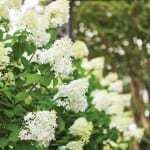 Plus, it gives you an option to keep from changing out every container in your garden each season,” notes Jennifer Gibson, a landscape designer with The Good Earth Garden Center, who also worked alongside the Parkers on the garden. 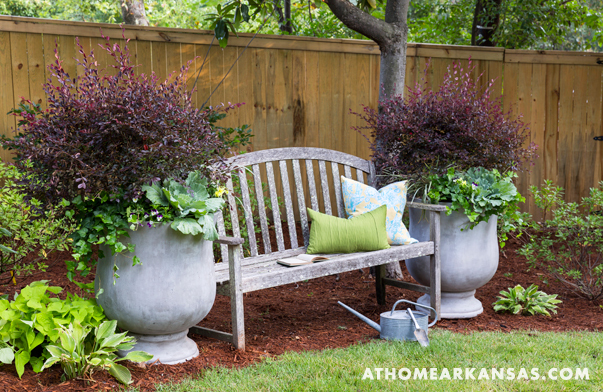 Pansies, ornamental mustard and kale, Mexican petunias, and other seasonal blooms add a finishing touch of color. 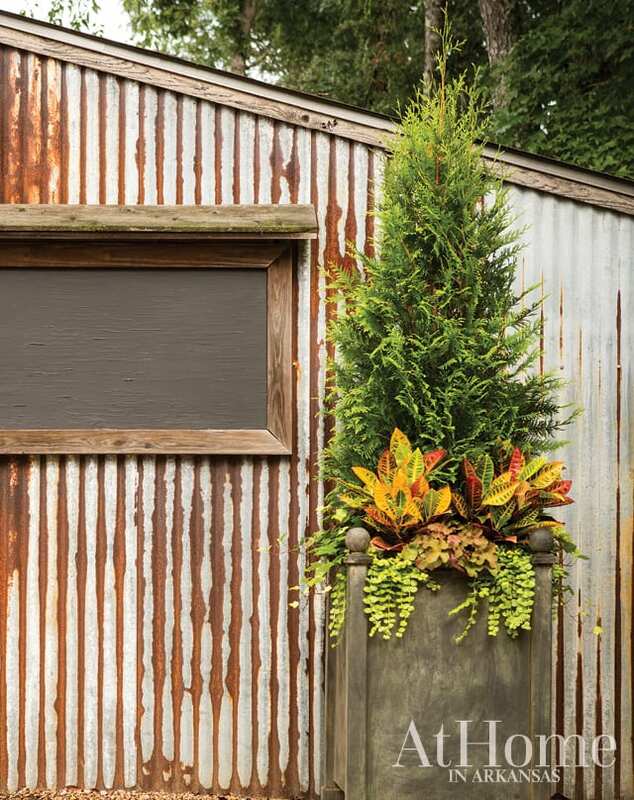 1) Containers aren’t just for annuals: Planting perennials, shrubs, ornamental grasses or even small trees in pots and surrounding them with annuals provides continuity throughout the seasons, broadens the range of texture possibilities, and gives more visual weight to container groupings. 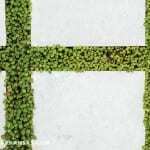 2) Mix and match elements in a grouping: Rather than using three matching planting containers, mix in an oversize glass jar, a small table or statue to add interest. 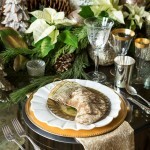 3) Choose your palette wisely: Warm colors (oranges, reds, and yellows) exude a feeling of excitement and high energy. 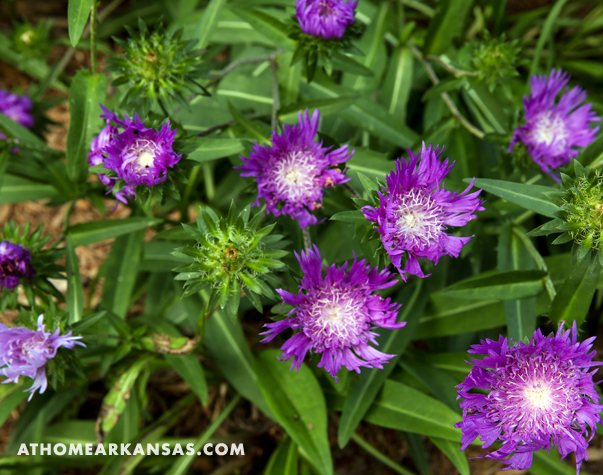 Cool colors (whites, blues, and purples) are more calming. 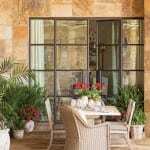 Consider the existing landscape, decor elements, and how the space is used when choosing a palette. 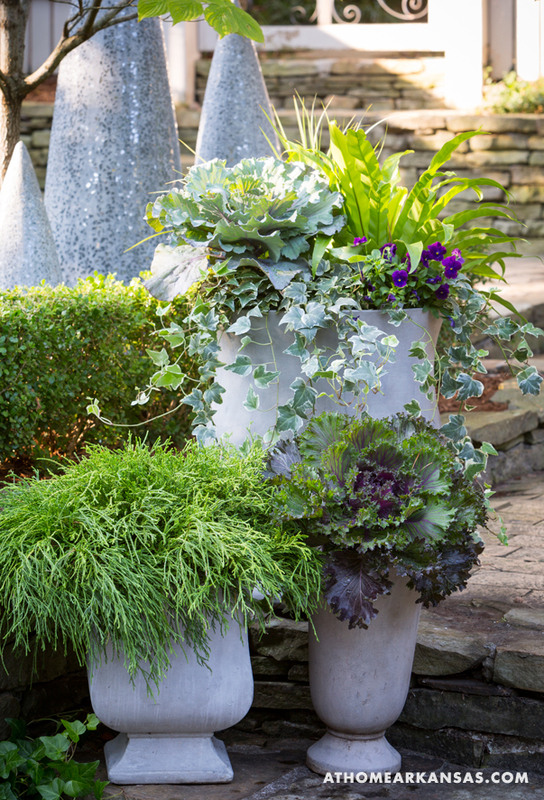 4) Create texture and contrast: Contrast and texture are key to creating an eye-catching display or container. 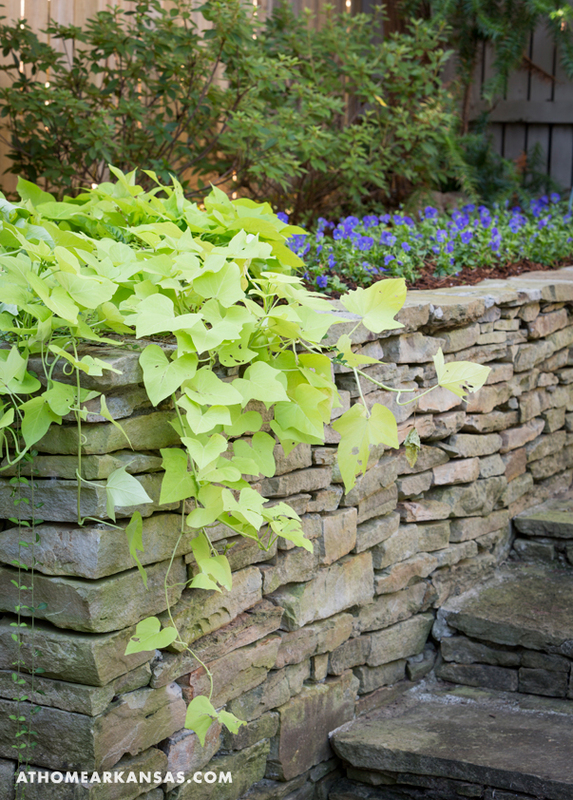 For example, a large-leaved plant couples well with a grass or fine-leaved plant. 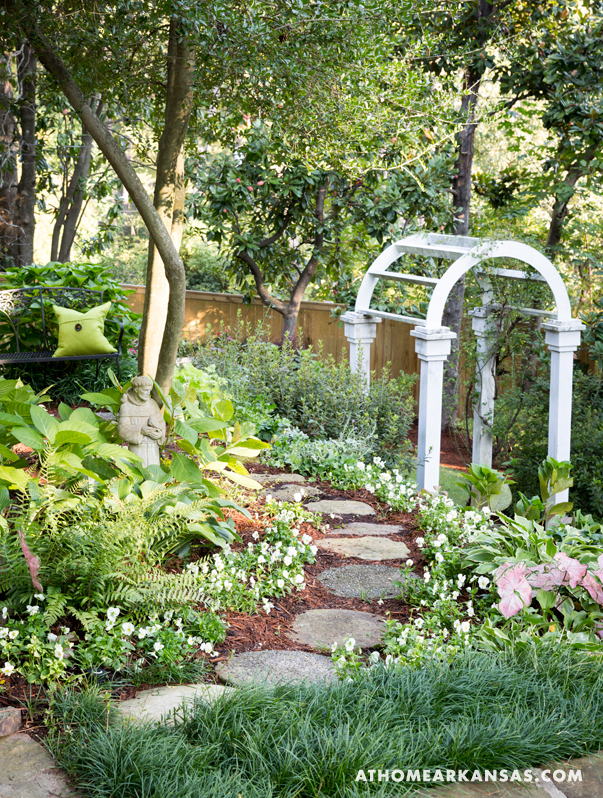 5) Create points of interest: Focal points in the landscape aren’t limited to plants; placing container groupings in landscape beds, nestling a freestanding water feature among plants, or even just maintaining a large space of groundcover and placing a boulder within the space can give the eye a place to land and linger. 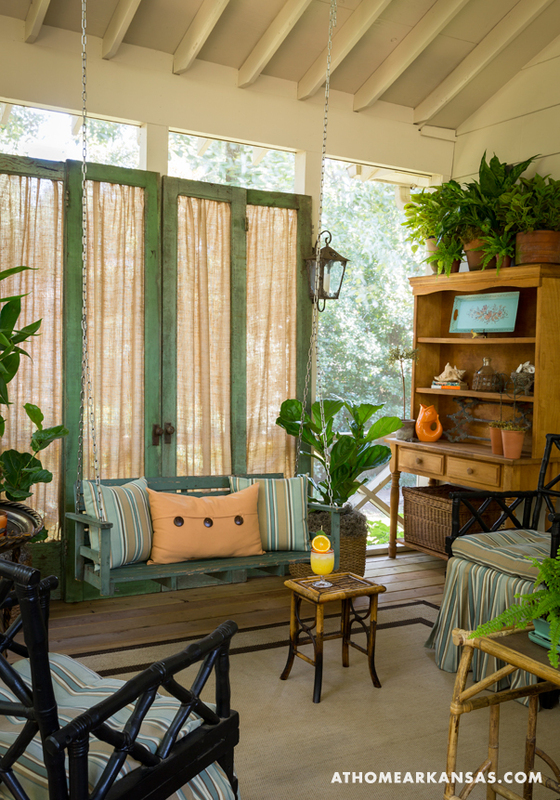 Inspired by a porch swing she found on an antiquing trip through Arkansas, Jana created a cool yet lively porch that works for drinks with friends as well as it does for an after-school snack with her two children. 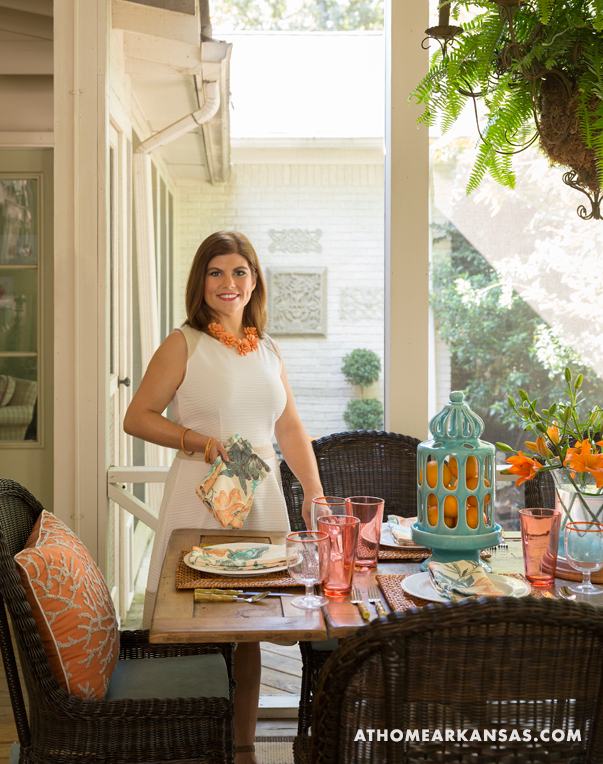 “I want guests to feel at home and at ease when they are here. A sign of a good party is when they stay four and five hours,” she says. 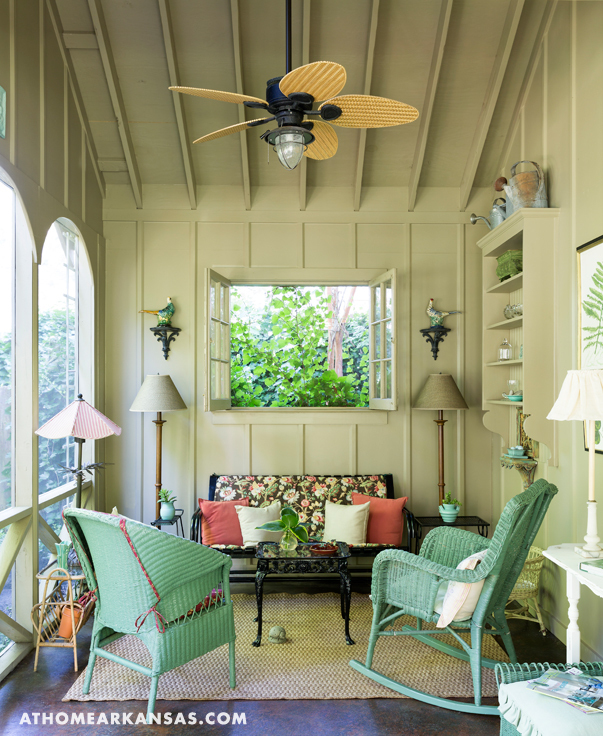 To create this feel throughout the porch, she incorporated finds that are either beautiful, functional, or fall into both categories: a bunny on the console is a nod to her trip to visit Bunny Williams with her mother and her daughter, an iron chandelier over the table holds seasonal plantings, vintage door frames (which were originally intended for her parents’ lake house) inset with burlap allow a breeze into the room, and lanterns hold battery-operated candles for a convenient glow. 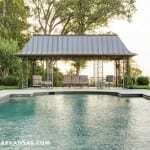 Pretty soon, the yard needed another structure among the dotted landscape—not to mention a place to store tools and organize all the accoutrements that come with an avid gardener’s passion—and plans for a garden shed were set in motion. 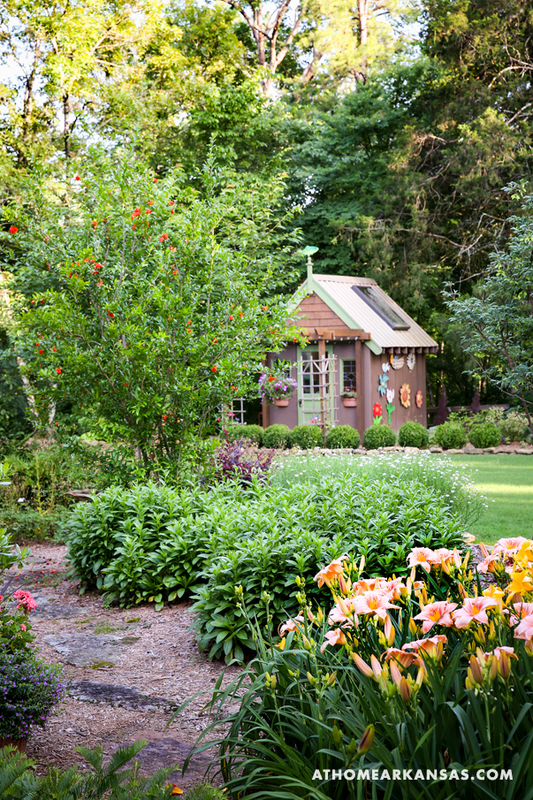 “I had a picture of a garden shed from a magazine that I had saved for twenty years; I just loved it. So, we ordered the plans,” Christina says. 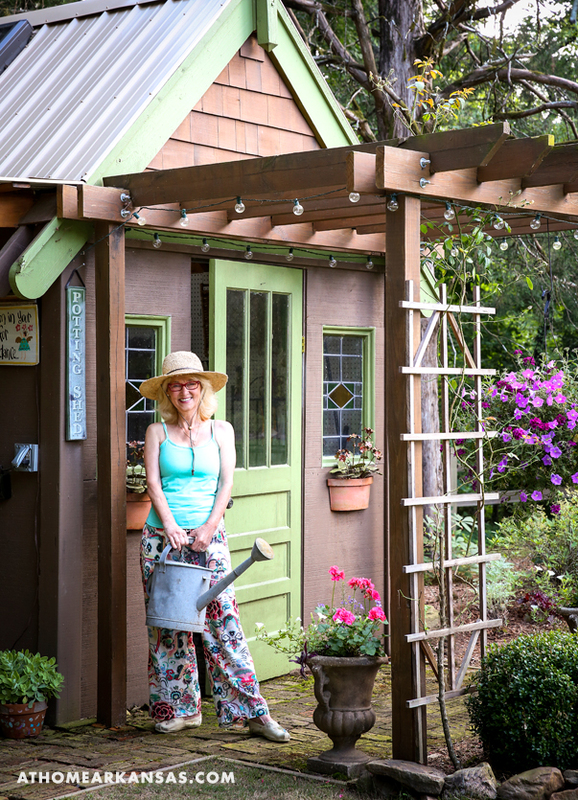 Ivo built the shed, which—thanks to two skylights—doubles as a greenhouse during the winter. 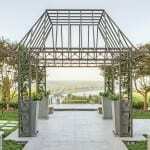 The couple, who work together on all the projects, also added a pergola to the structure to give room for hanging plants. 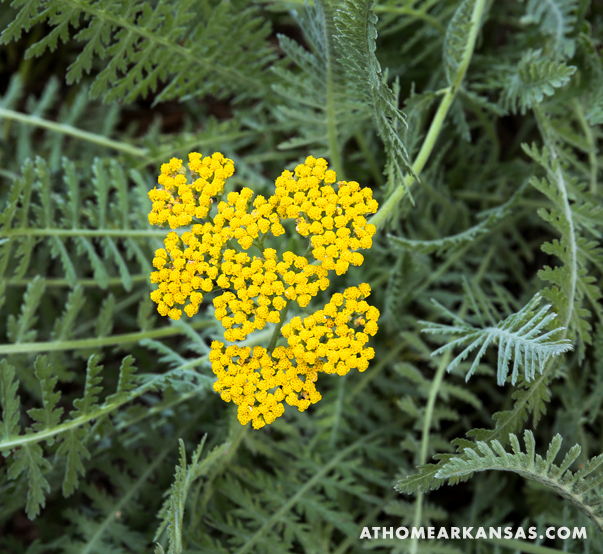 “My passion is to share the garden—it’s not just for the two of us. I like to have people over for lunches or dinner and see them relax and unwind in our garden. 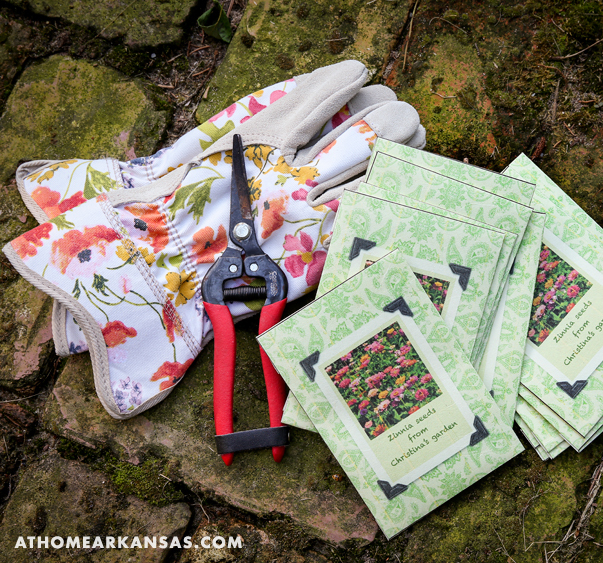 And, of course, I always share cut flowers and seeds with others,” Christina says of her overarching purpose for the naturally beautiful garden. Each year she dries flowers from the garden by hanging them along the shed’s pergola. She collects the seeds and creates packets to give to friends for their own enjoyment. 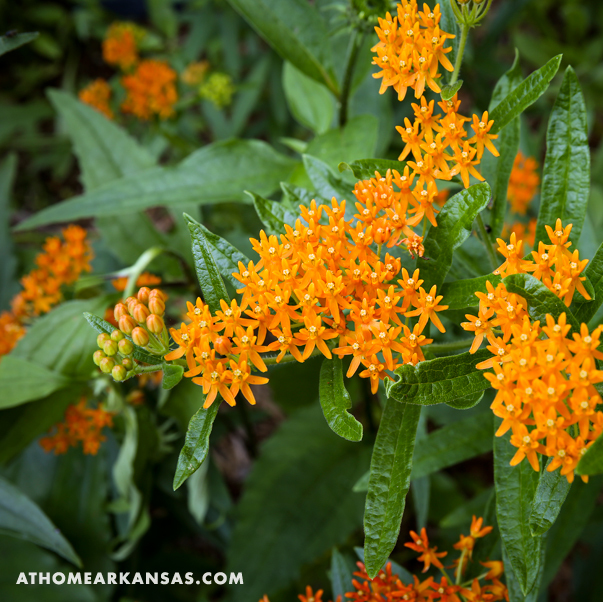 Like most people, Jeanne and Dan Spencer never imagined a tornado might bring them joy. However, that was just the case in April of 2011 when gusts from the storm that blew through Prospect Terrace flattened their small, detached garage and sitting porch. 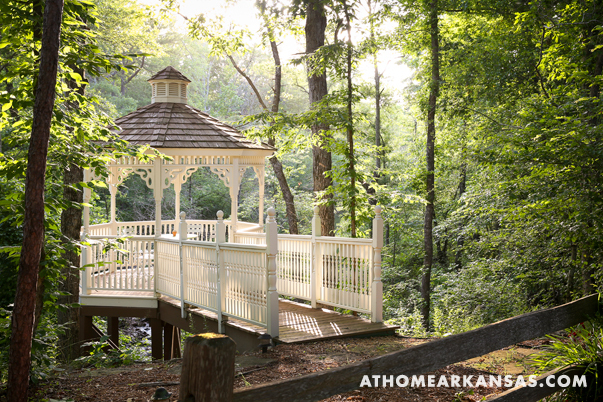 A year and a half later, the couple put the finishing touches on a new version of the beloved outdoor space, which was originally constructed in 1924. 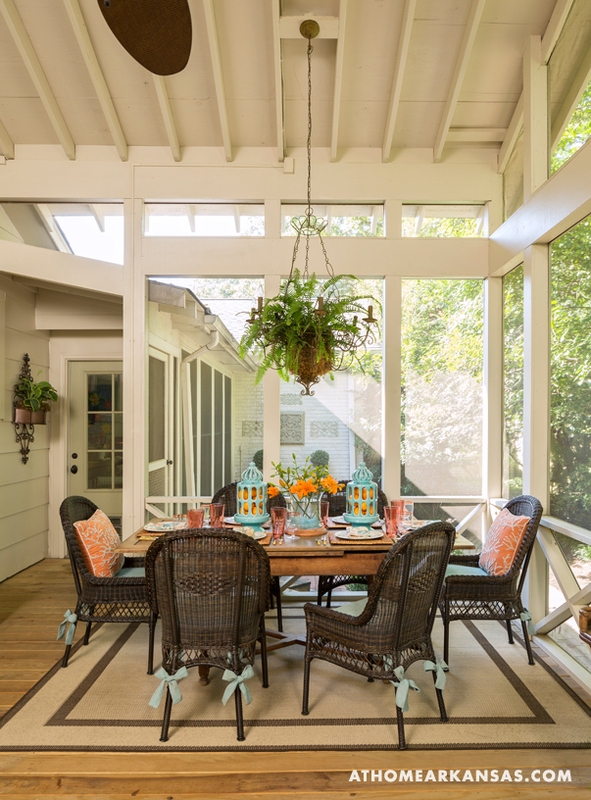 This time they gave it a slightly larger footprint but kept many of the treasured pieces that make the screened-in living room so comfortable and personable. 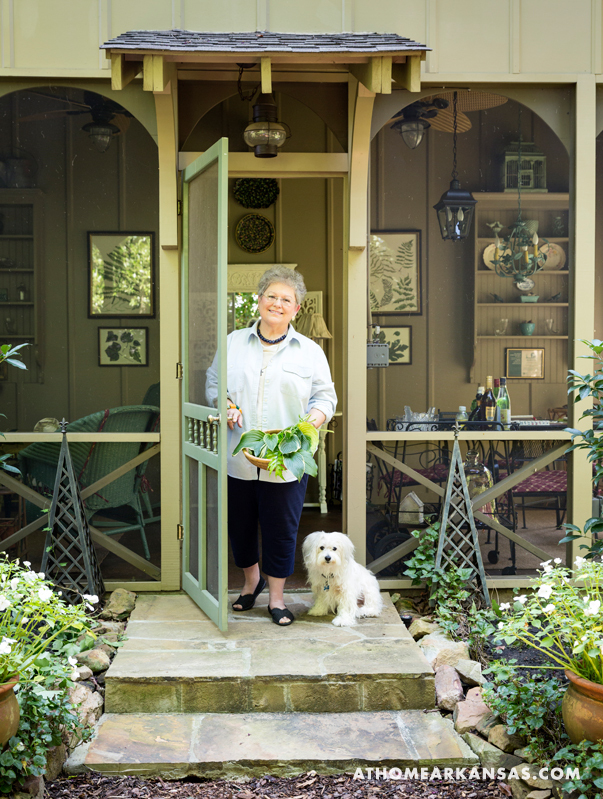 When the weather is warm, Jeanne, shown here with her dog Jiggs, can be found on the porch almost any time of day. “I love to play Mah Jongg with friends out here. 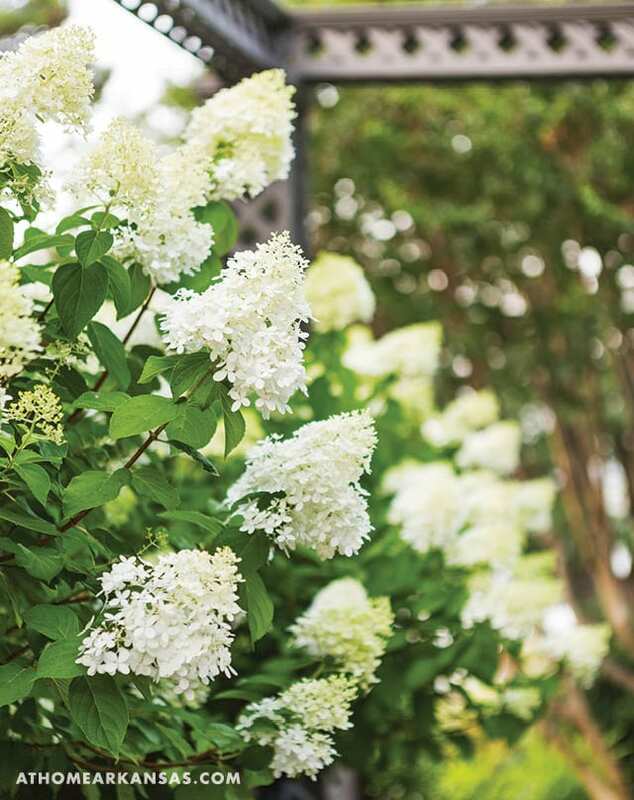 I also take my morning coffee out here; in the afternoon I’ll have tea for anyone who drops by; and then, after five o’clock, I serve gin and tonics on the porch,” Jeanne says of her congenial beverage schedule. 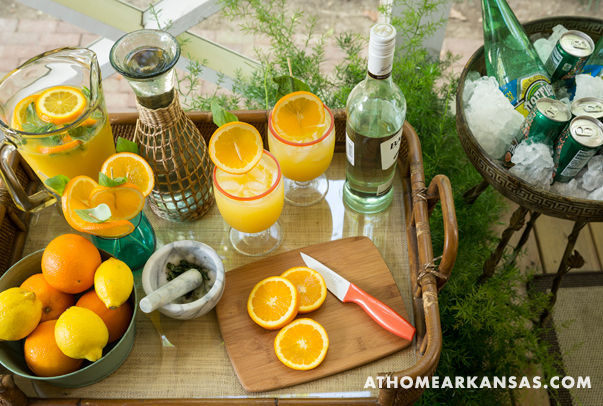 However, her hospitality isn’t the only thing that makes the porch so welcoming. 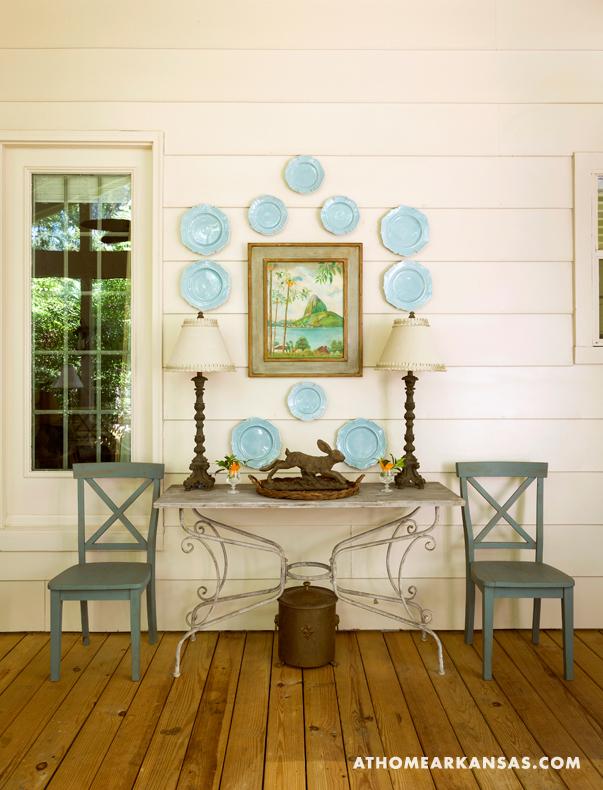 Furnishings that were handed down, purchased from friends, or even created by Jeanne—who holds both art and interior design degrees—create the sort of Southern aura one would expect to find on a porch of this nature. 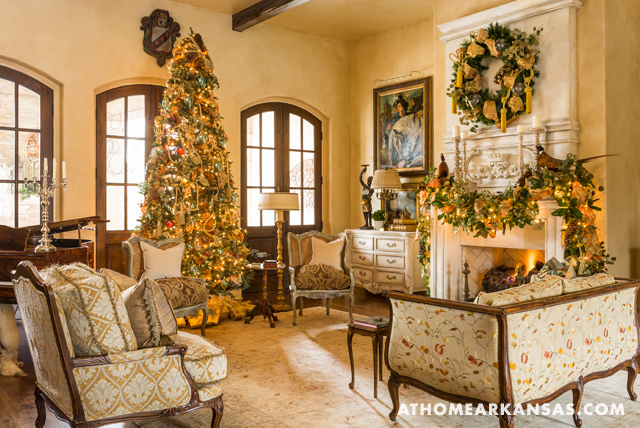 For instance, the glider that sits along the far wall once welcomed guests at both Jeanne’s grandmother’s home and her parents’ home. 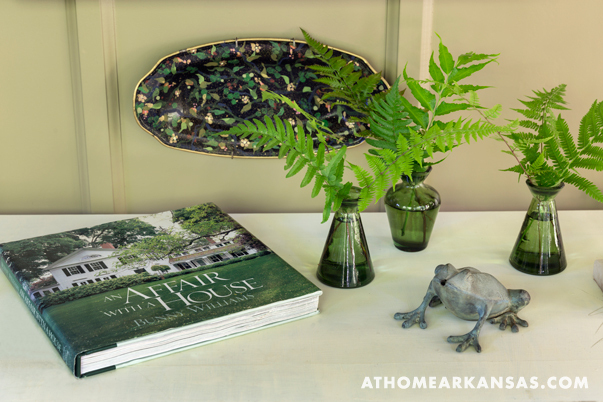 Similarly, the coffee table that offers a resting spot for your beverage of choice was purchased from her art teacher at Central High School, while the botanicals that hang over the porch’s white console table were painted by Jeanne herself, using leaves from her garden as an inspirational guide. In the same manner, she leaves no detail undefined. The window situated over the glider may appear to have been original to the 1924-version of the garage, but it’s actually a find Jeanne discovered at Mid-Towne Antique Mall when she first began to rebuild the structure. 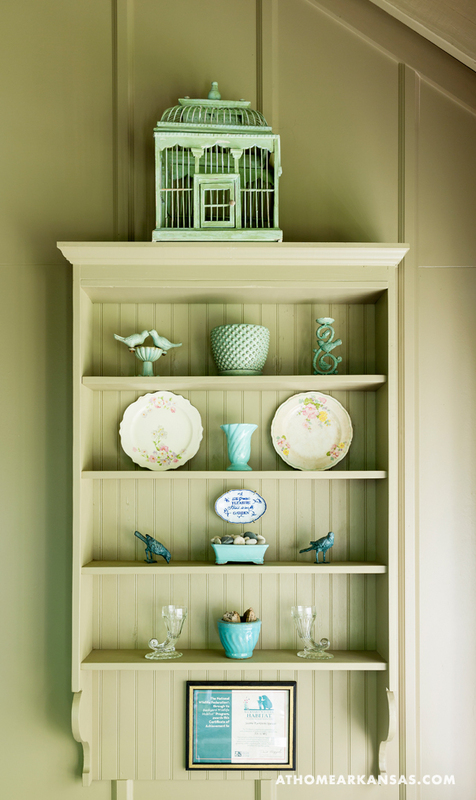 Together, these details and personal touches come together to create a retreat that’s sure to make you want to stay for a spell. “The neatest part is the structure itself,” Beringer says of the house, which is Stephens’s own vision realized by architect Tom Fennell. 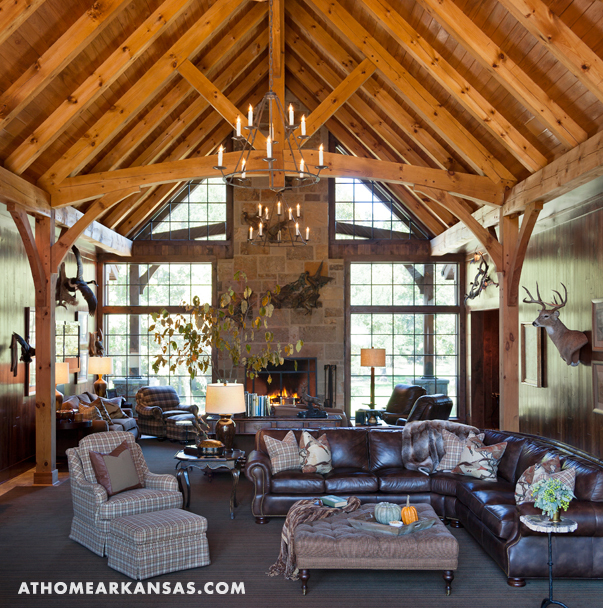 “All of the built elements that you see are structural—none of them are ornamental.” The impressive white pine beams and arches of the great room’s timber-frame construction bear the full weight of the building, leaving the interior space entirely free of obstruction or partition. 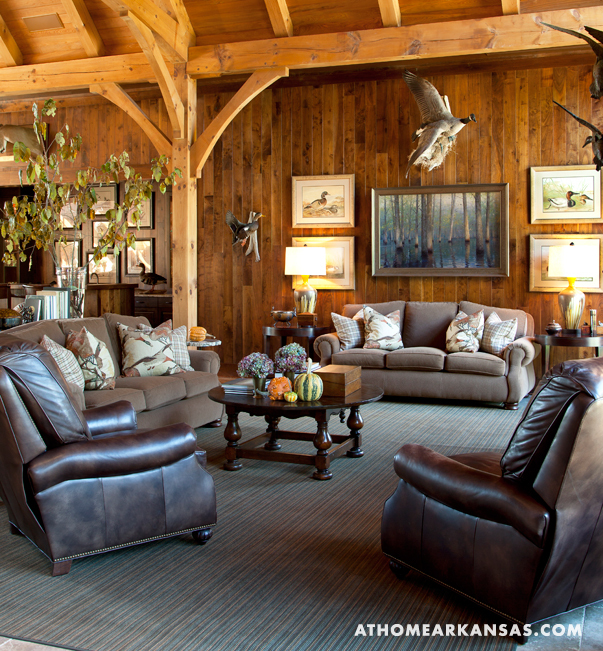 This allows Stephens to bring all of his guests together in one space throughout the hunting season. 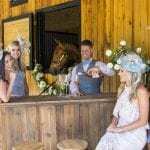 The open-plan area is especially useful during the annual opening weekend festivities when Stephens typically entertains a crowd of 18 friends, family, and business associates. 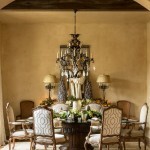 A room of such vast proportions posed a special challenge when it came to furnishing the space. “It’s a big room and we wanted lots of windows and lots of seating, but we still wanted it to feel cozy and intimate—not like a hotel lobby,” Beringer says. A custom, room-sized rug unifies five generous seating areas and encourages traffic flow throughout the activity zones, which include a wetbar and a gaming area in addition to traditional conversation spaces. 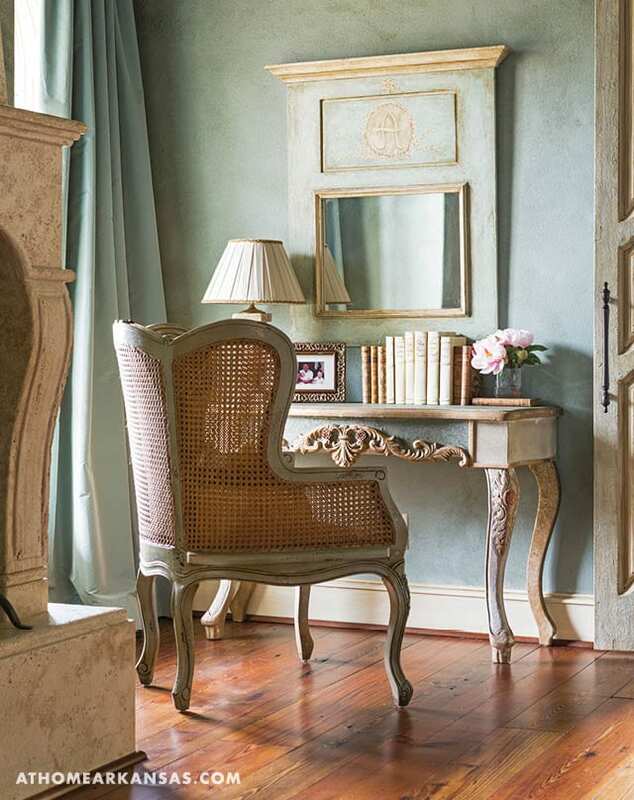 The natural wood tones present in the room also help to visually warm and enrich the space. 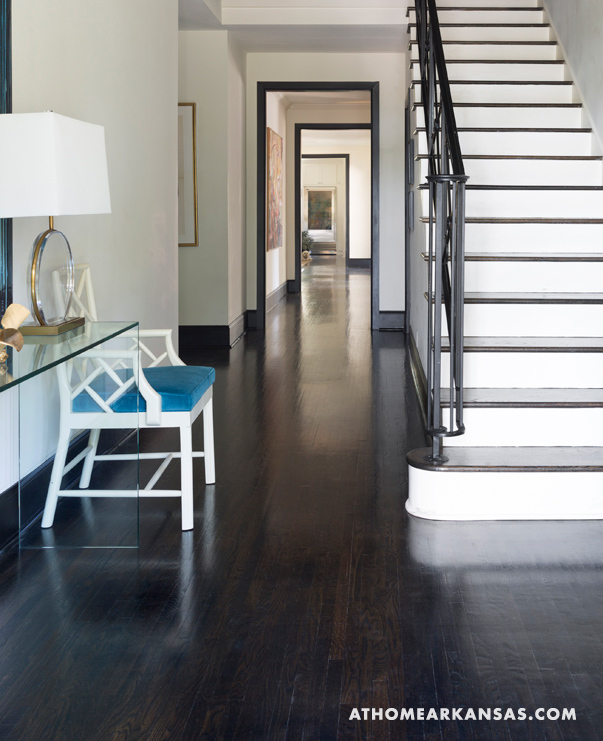 The ceiling is pine, and the walls are walnut hardwoods—the type typically used as flooring. 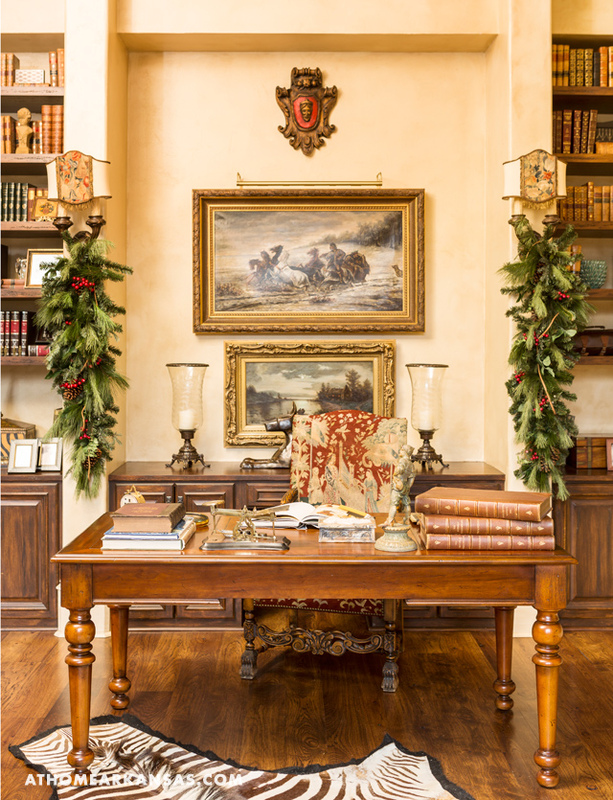 “We didn’t want to do traditional paneling,” Beringer says, “because we didn’t want it to look quite so dressy.” Overall, the design works to make the room comfortable and pleasant by bringing it down to human scale, yet allowing visitors to delight in the impressive structure. 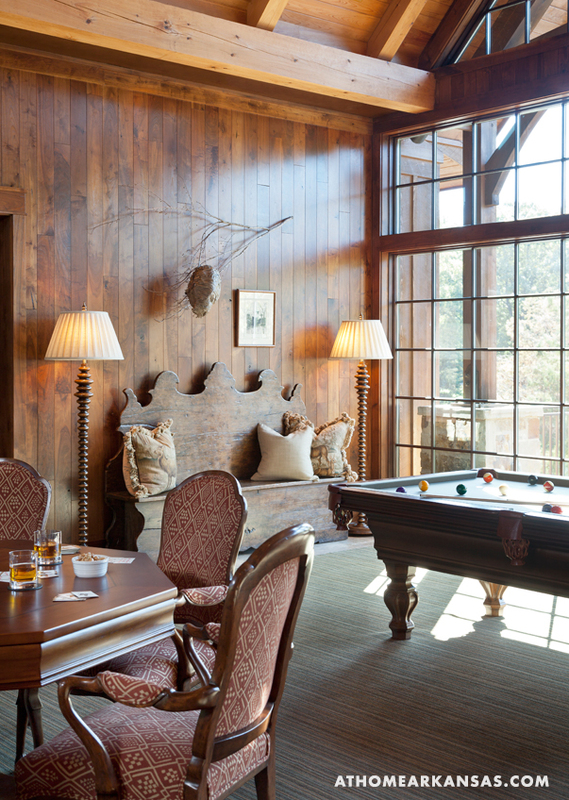 The décor of the lodge needed to be “rich and interesting,” according to Beringer, in order to keep a visitor’s eye excited and engaged; so, throughout the great room, “there’s a lot of interest everywhere you look,” he says. 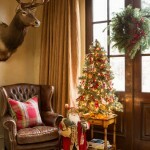 The fabrics Beringer selected vary in both pattern and content. 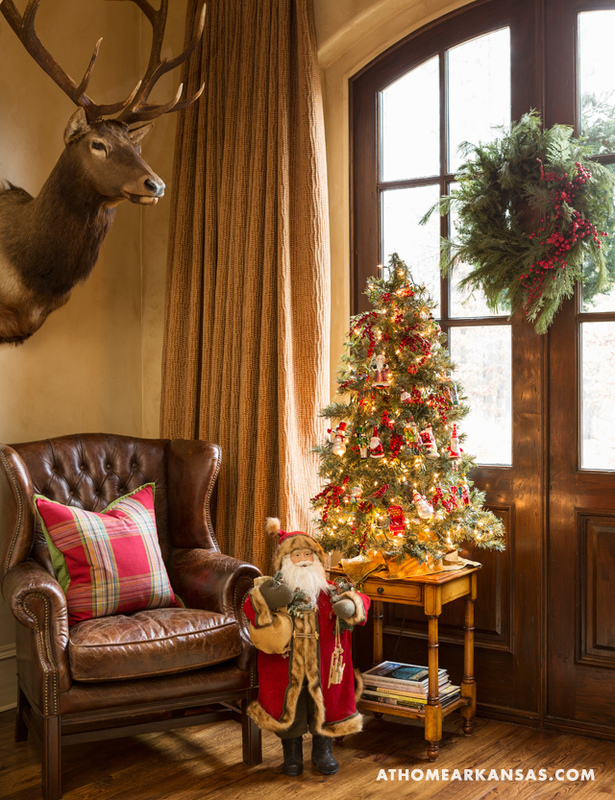 Woven textiles, leathers, and wools all play a role, as do wildlife prints and two needlepoint pillows depicting deer, given to Stephens as a lodge-warming gift by his mother. 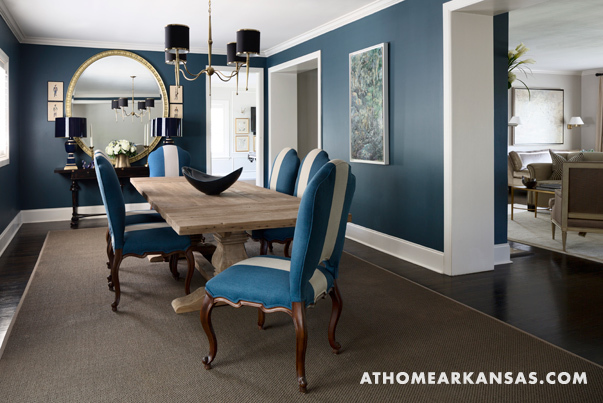 Plaids of two different scales play-off one another to give the space a more acquired, less contrived, look. 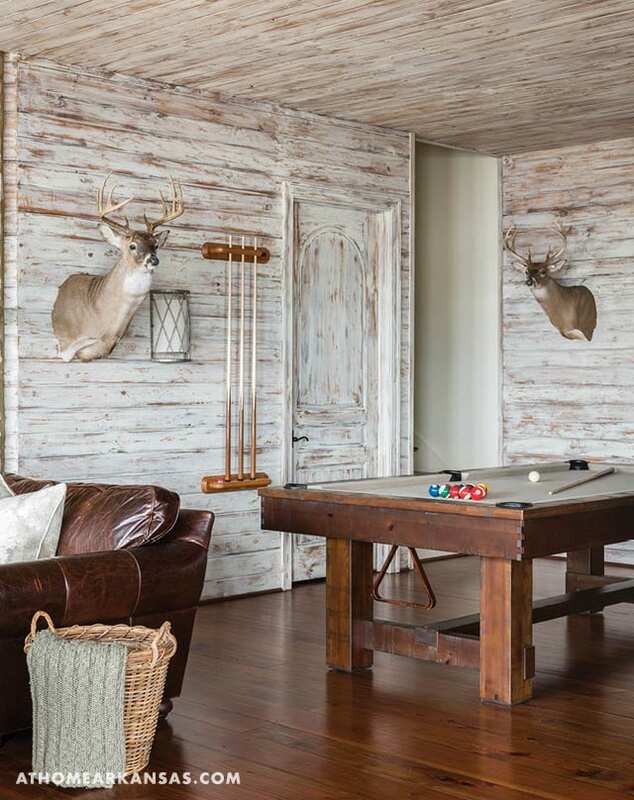 In addition to the numerous wildlife specimens that adorn the walls—including a vacated hornet’s nest found on the property—diverse textures and surfaces add depth to the design. 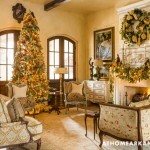 A few examples: the bar countertop is made of ceramic, copper-colored penny tiles; the sofas in the fireside seating area are upholstered in alpaca wool velvet; the ceiling in the dining area is glazed to create a leathery effect; and the custom-made dining table is walnut with a pecan inlay in a herringbone pattern. 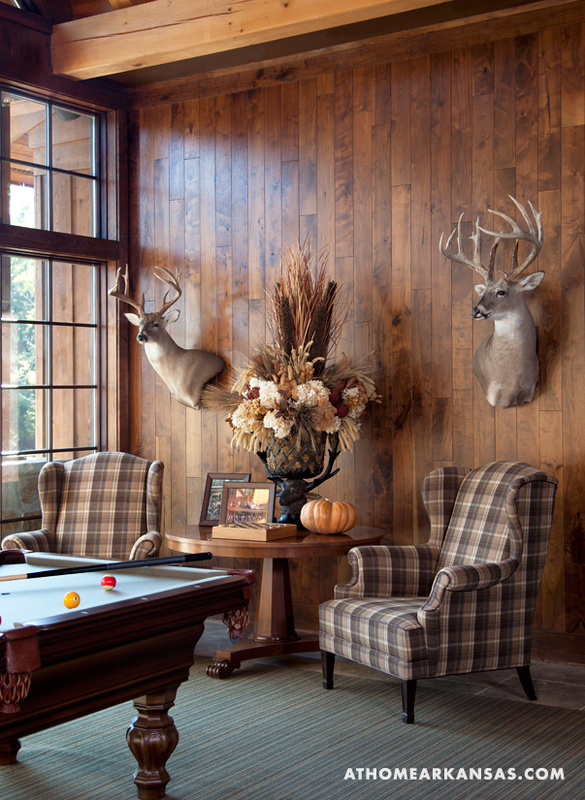 While you might expect to find rich woods and leathers like these in any stately hunting lodge, unique choices and surprising combinations create the sense that there’s no end of fascinating details to appreciate. 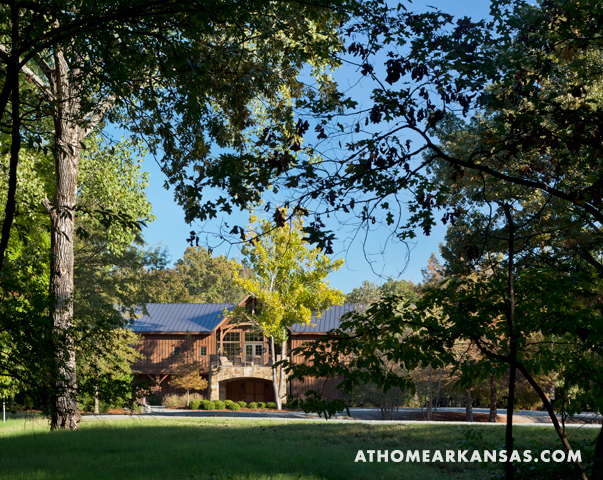 An enthusiastic outdoorsman, former commissioner of the Arkansas Game and Fish Foundation, and now steward of the property at Screaming Wings, Beringer says that Stephens feels strongly that the representations of wildlife and natural settings present in the lodge be authentic to the region and to this piece of land in particular. 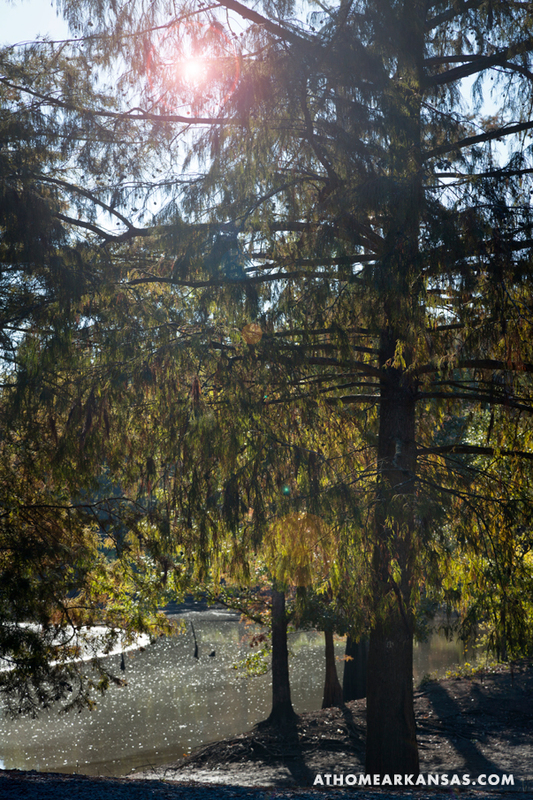 The numerous taxidermic specimens of waterfowl and deer are all local to the immediate area, and even the bronze sculpture of ducks taking flight—commissioned for the stone chimney wall and affixed above the fireplace—needed to depict Screaming Wings’ flora and fauna with fastidious accuracy. 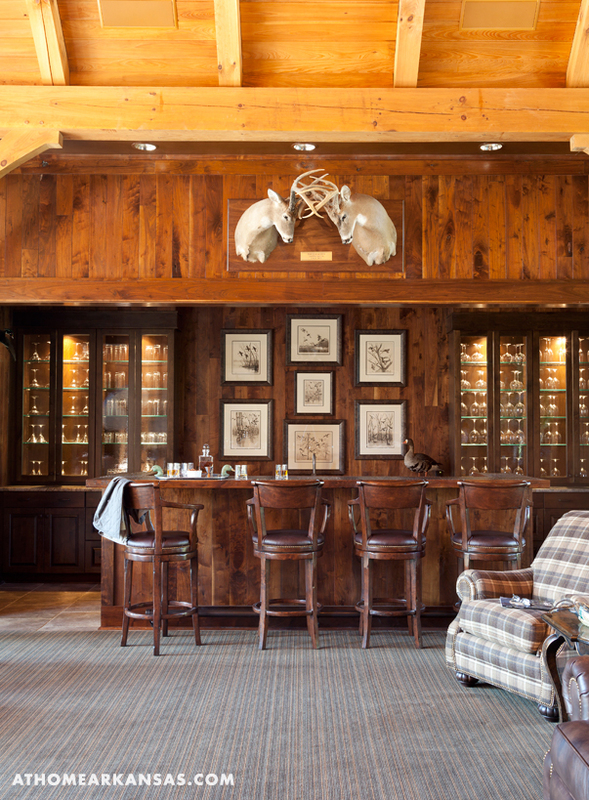 Stephens’s remarkable collection of wildlife artwork is also showcased throughout the space, an ever-present reminder that the land—and the lodge—is a true sportsman’s paradise. Knowing the rules and always playing by them are two different things. 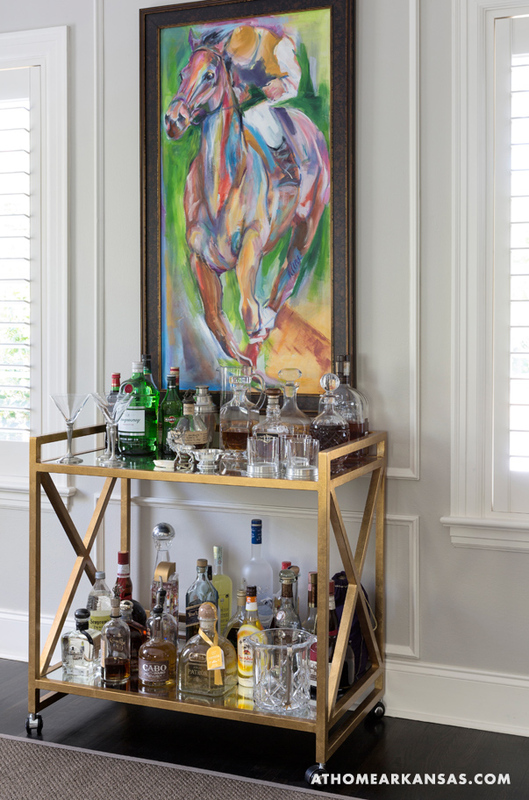 Designer Joshua Plumlee uses color, art, and custom furnishings to shake up traditional design and to make this home a reflection of its fun-loving owners. 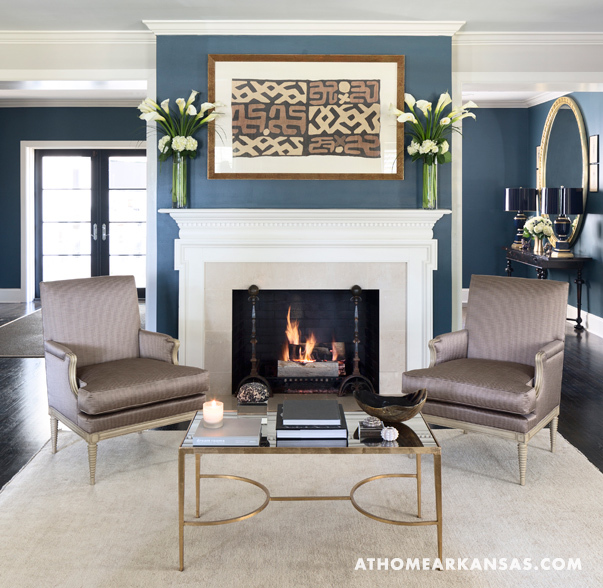 When Julie and Jason Smith and their two children moved into a home in the Heights neighborhood of Little Rock, they turned to designer Joshua Plumlee with Cobblestone & Vine to help bridge the gap between the classic look of the house and their distinctive personal style. “They are just a very interesting family;” Plumlee says, “they’re quirky and fun, with great taste in art. The house is very traditional, and it’s in a very traditional neighborhood, and the design needed to make sense in that context. 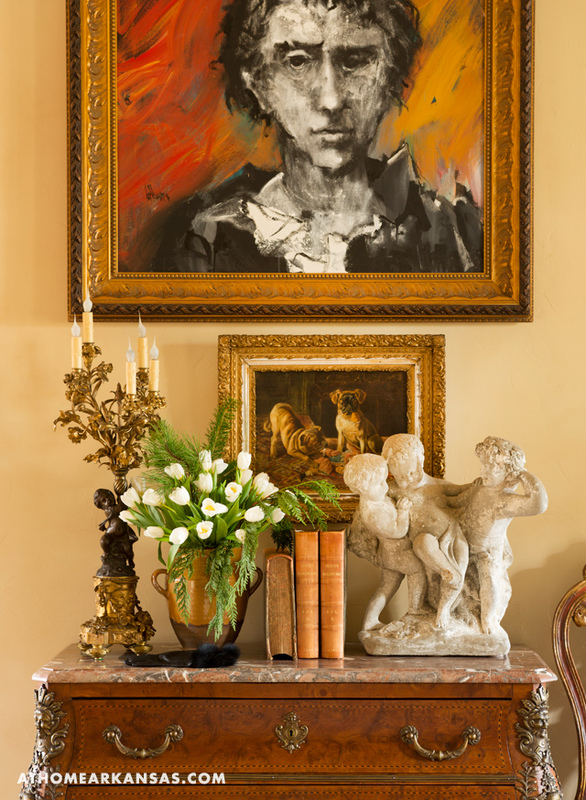 But we also wanted to have some fun with colors and art—stepping outside of what is expected.” The result is a moody and glamorous—yet inviting—home that delights in its own eccentricities and offers a unique take on traditional home decor. 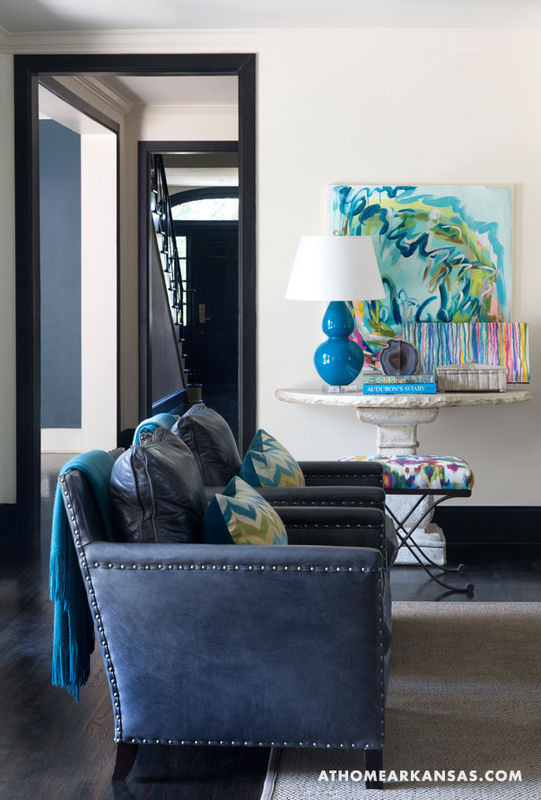 Shadowy blues and grays dominate the color scheme in a painting of a cathedral that greets guests at the home’s entry. This painting, by Hans Feyerabend, was the first piece of art Julie purchased after moving into the new home, and, Plumlee says, “it dictated much of the [home’s] palette, especially the navy; we just loved it so much.” The rich, smoky marine carries throughout the home—on the dining room walls and the fireplace accent wall in the formal living room. 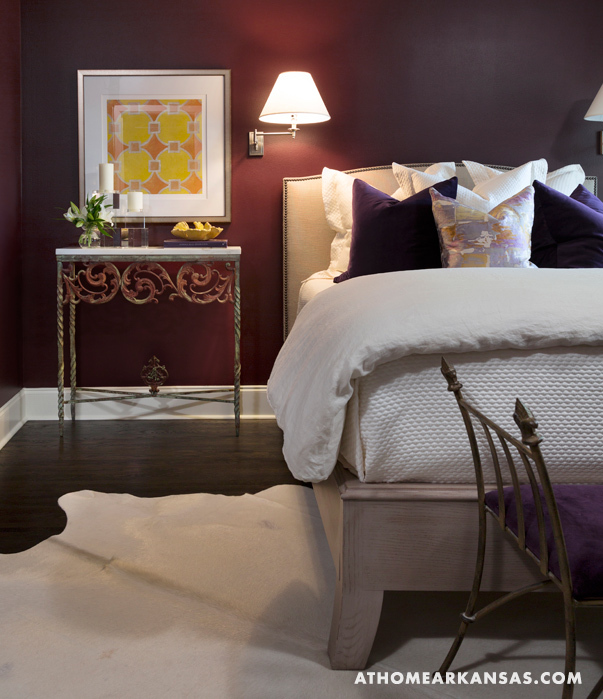 Overall, the deeper hues Plumlee selected, including the dusky aubergine in the guest room, create drama and really set the tone of the design. 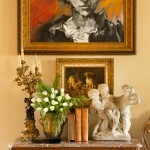 Perhaps most compelling is the diverse collection of art showcased throughout the home. 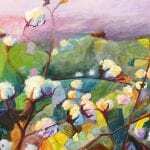 Plumlee describes his design approach as “art-centric,” explaining that, to his mind, “everything should play second fiddle to the art.” Longtime collectors, the Smiths brought many of the pieces from a previous home, but some of them are new to the family, including a number of paintings done by Plumlee. From black-and-white photographs of grain silos to abstract paintings and tribal textiles, the art enhances the experience of every room in the house, either by harmonizing with the design or by presenting a visitor with the pleasing friction of encountering the unanticipated. 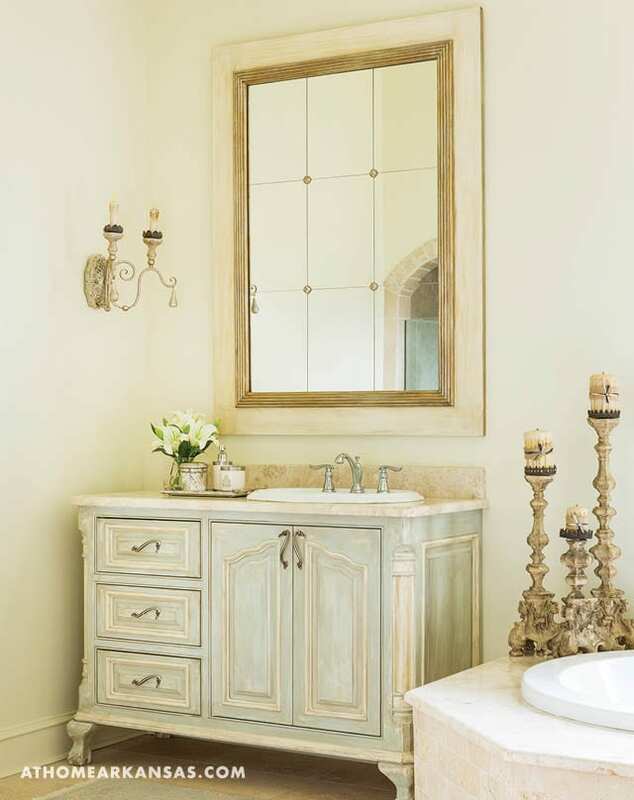 To achieve a collected, deeply personalized look in the home, Plumlee embraces the interplay of opposites: the polished with the rough-hewn, the dramatic alongside the delicate. The result? 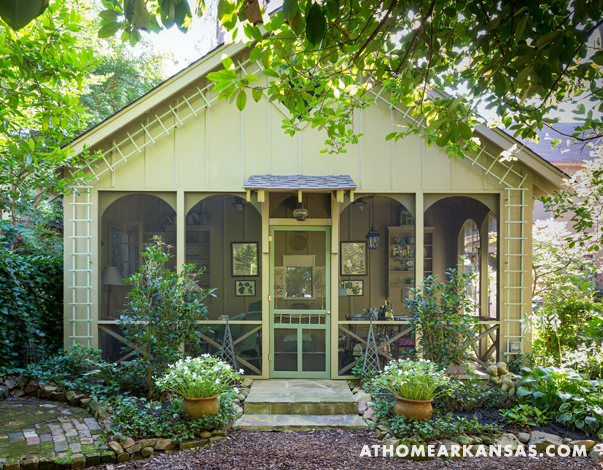 A predominately serious home with a whimsical wink. 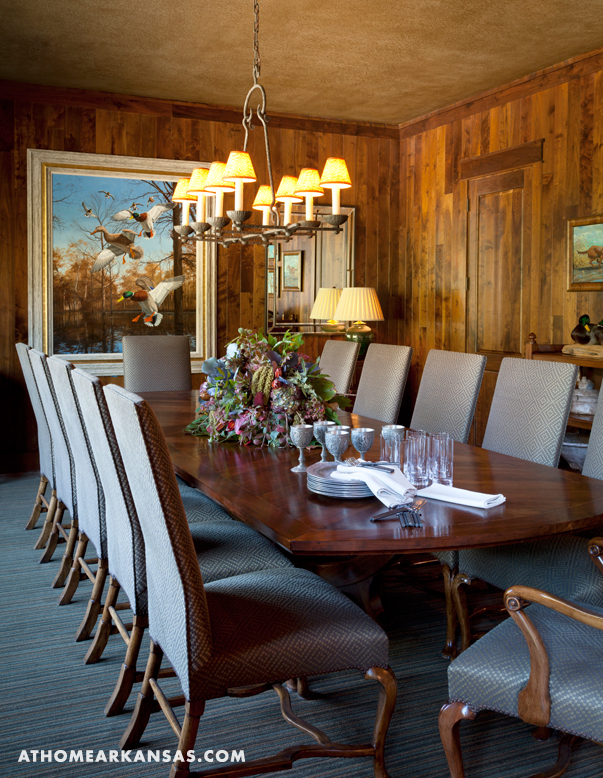 In the dining room, the high-gloss of the lacquered lampshades juxtaposes with the rustic, unpolished table. Plumlee says “In one way, the choice is a play to kid-friendliness, but the design also needs to feel tried and true.” In the same vein, when it comes to the home’s various metal finishes, Plumlee’s attitude is: “Mix it up!” His own impulse—and the Smiths’ personal style—is very resistant to the look of what he calls a “homogenized home,” where everything matches everything else and exactly meets a visitor’s expectations.